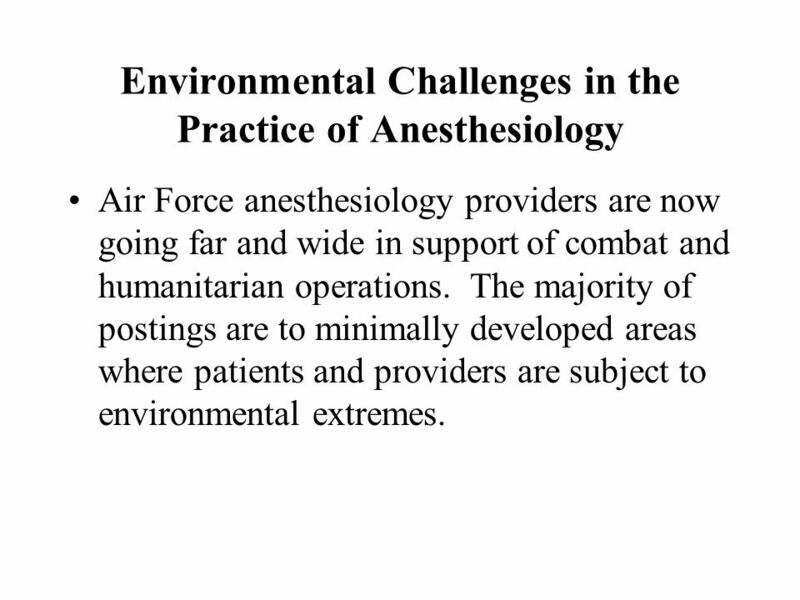 Air Force anesthesiology providers are now going far and wide in support of combat and humanitarian operations. The majority of postings are to minimally developed areas where patients and providers are subject to environmental extremes. 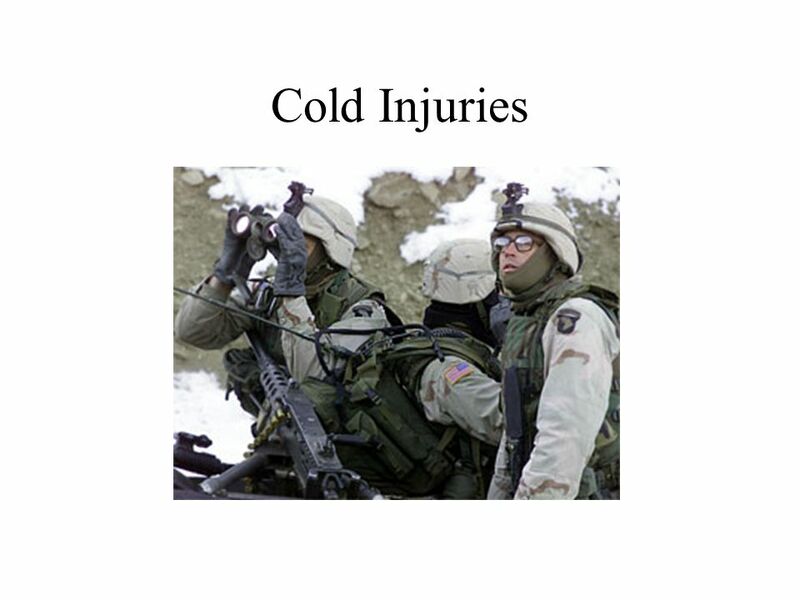 Deployment presents numerous personal and professional challenges. 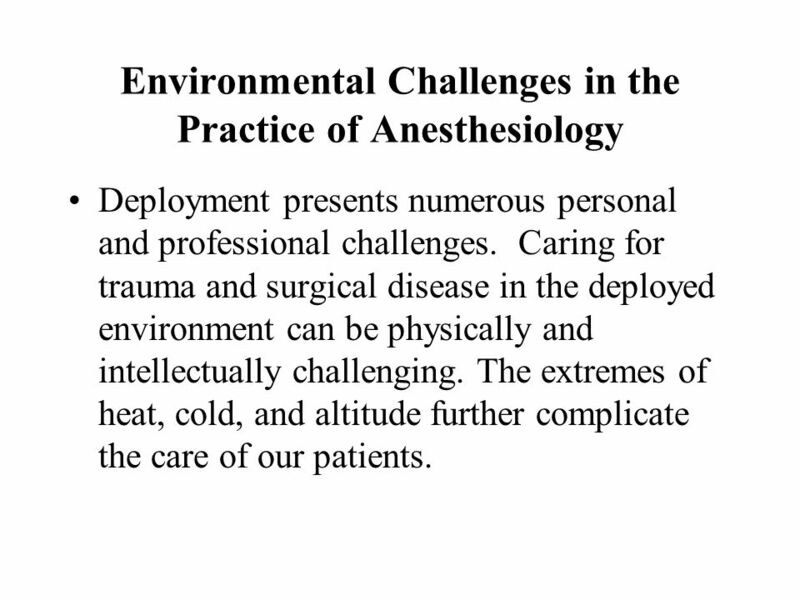 Caring for trauma and surgical disease in the deployed environment can be physically and intellectually challenging. 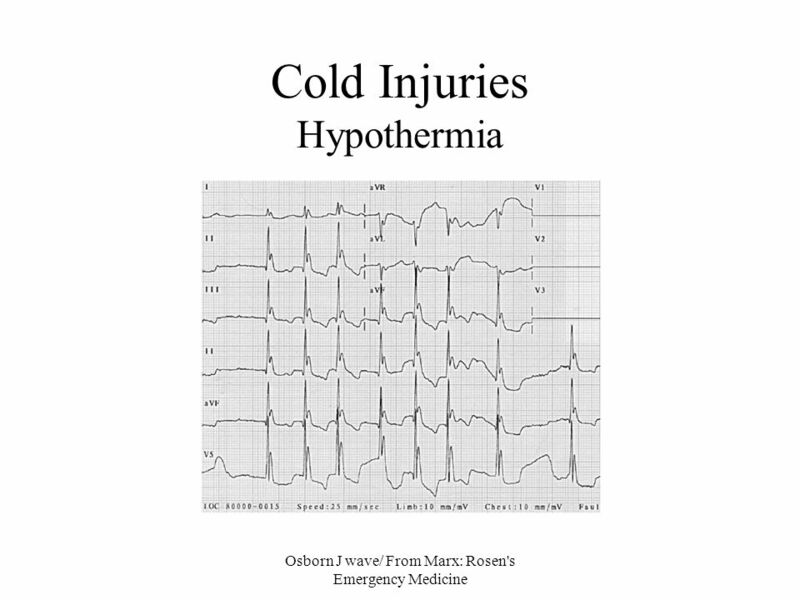 The extremes of heat, cold, and altitude further complicate the care of our patients. 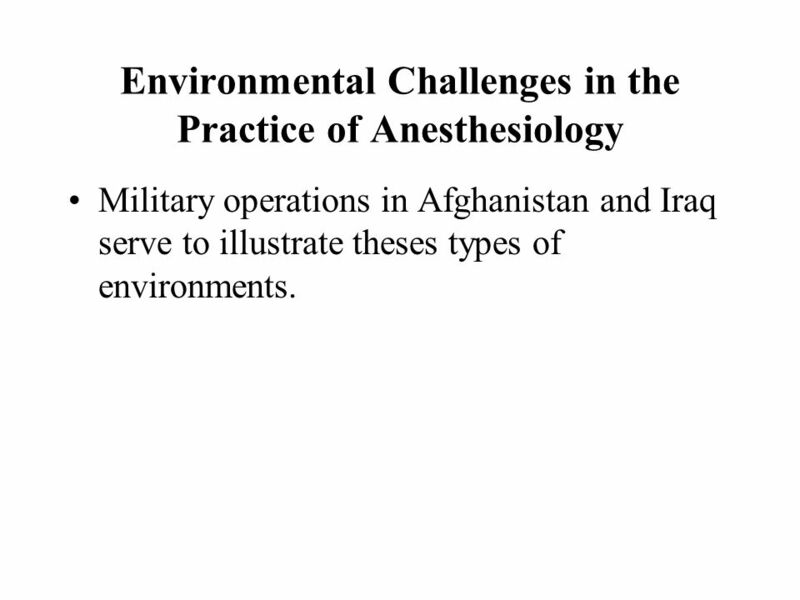 Military operations in Afghanistan and Iraq serve to illustrate theses types of environments. 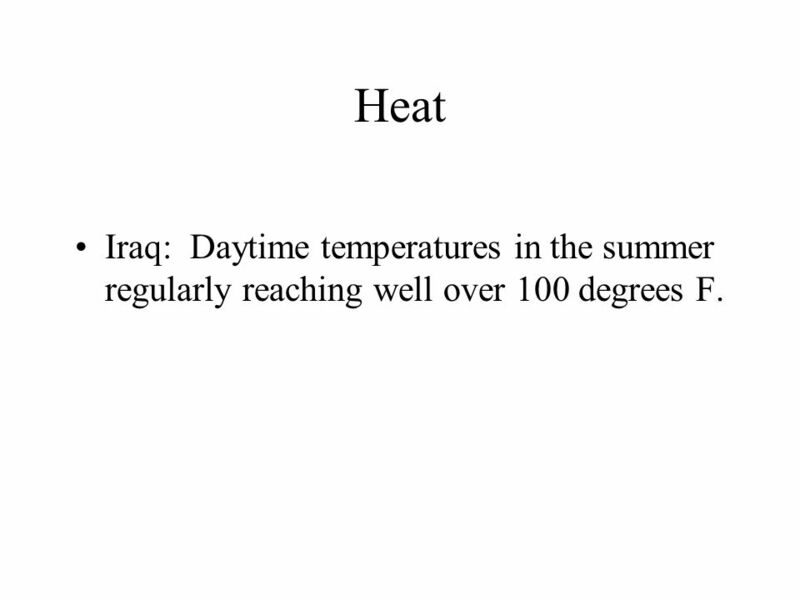 5 Heat Iraq: Daytime temperatures in the summer regularly reaching well over 100 degrees F.
6 Cold Afghanistan, Operation Anaconda: Soldiers fought for extended periods in temperatures well below freezing in the mountainous Shah-I-Khot region. 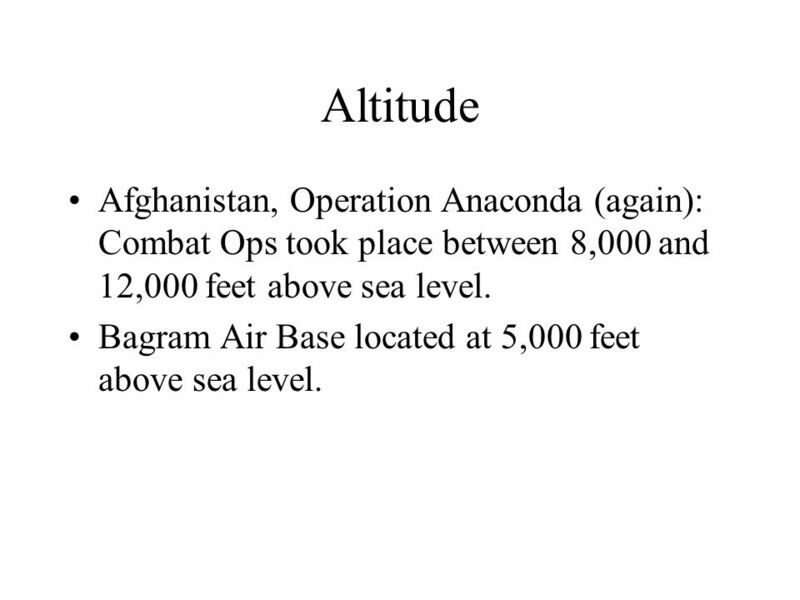 7 Altitude Afghanistan, Operation Anaconda (again): Combat Ops took place between 8,000 and 12,000 feet above sea level. Bagram Air Base located at 5,000 feet above sea level. 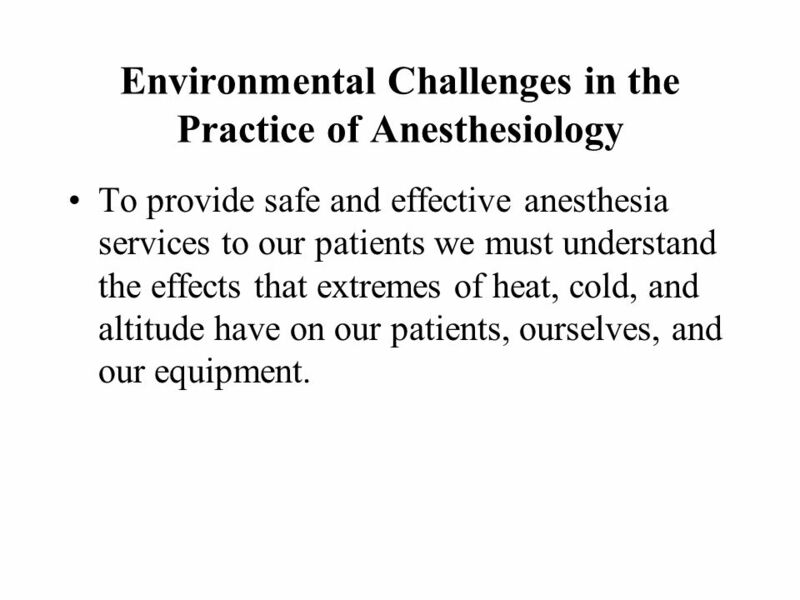 To provide safe and effective anesthesia services to our patients we must understand the effects that extremes of heat, cold, and altitude have on our patients, ourselves, and our equipment. 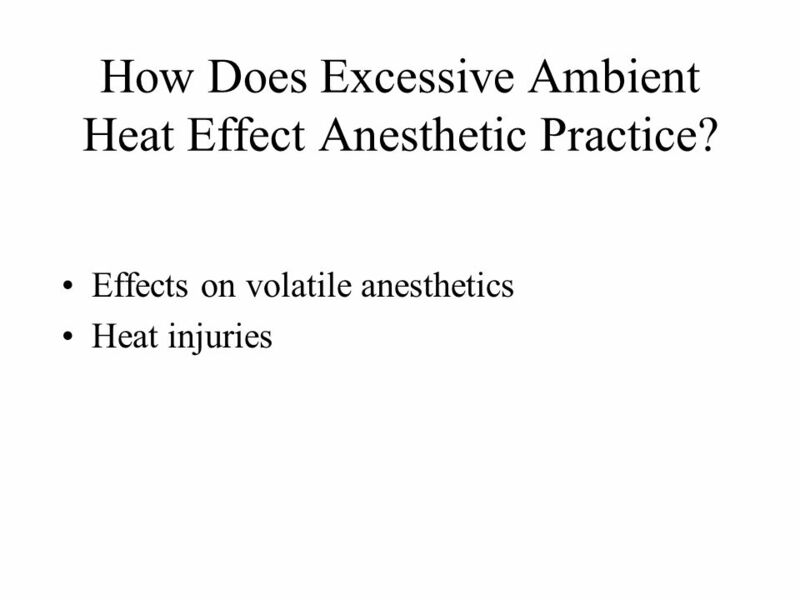 9 How Does Excessive Ambient Heat Effect Anesthetic Practice? 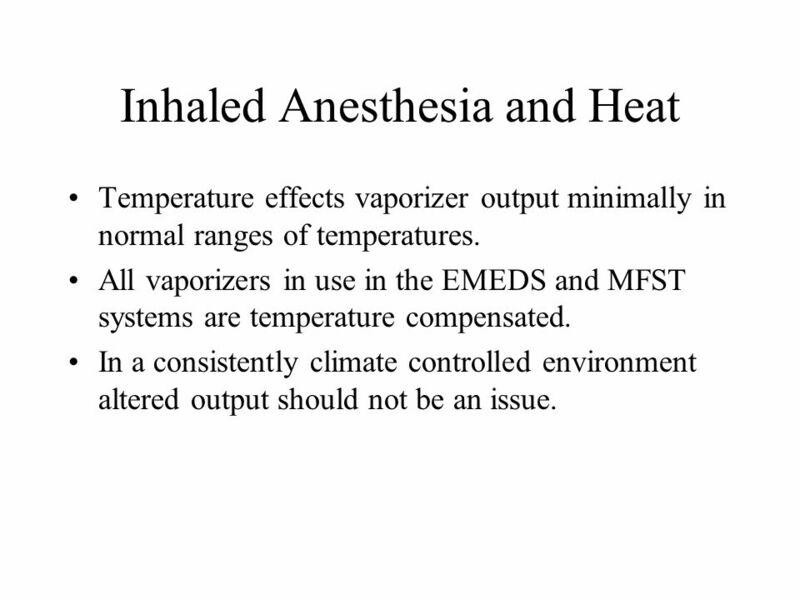 Temperature effects vaporizer output minimally in normal ranges of temperatures. 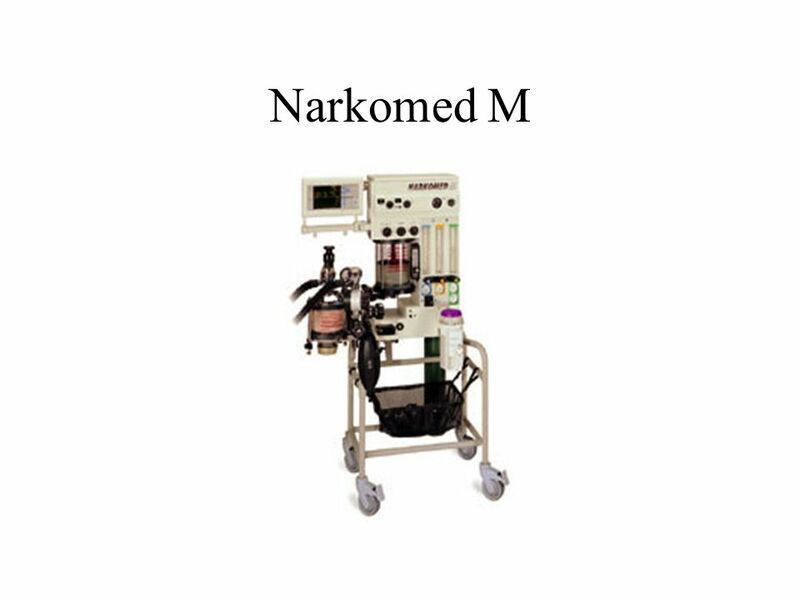 All vaporizers in use in the EMEDS and MFST systems are temperature compensated. In a consistently climate controlled environment altered output should not be an issue. 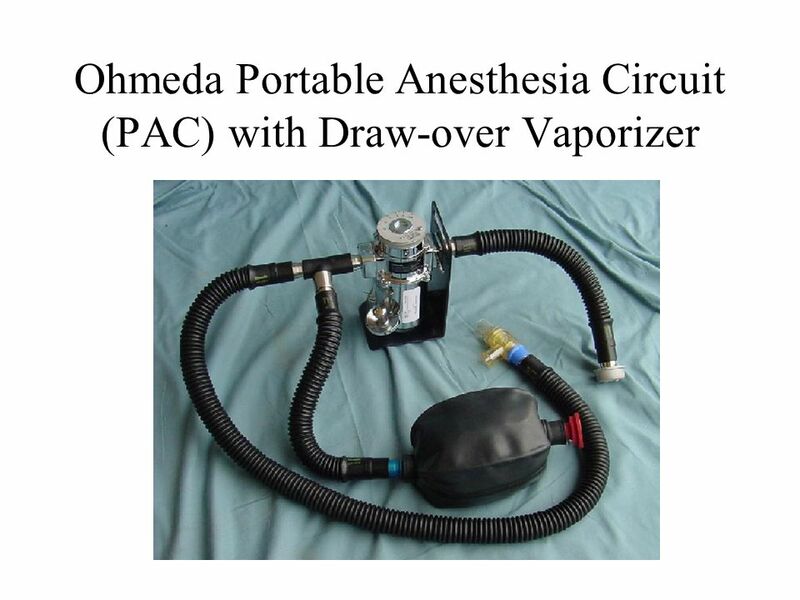 The Ohmeda Portable Anesthesia Circuit (PAC) Draw-Over Vaporizer System (primarily still in use with MFST). 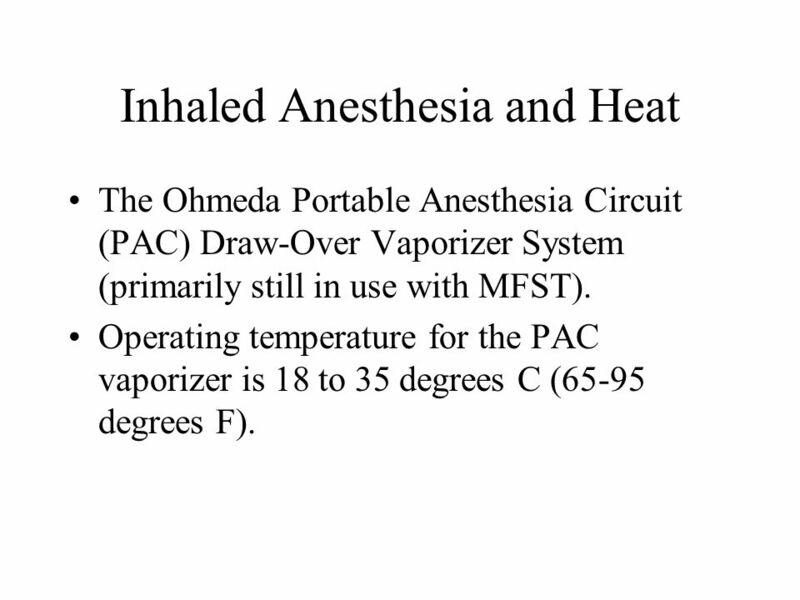 Operating temperature for the PAC vaporizer is 18 to 35 degrees C (65-95 degrees F). 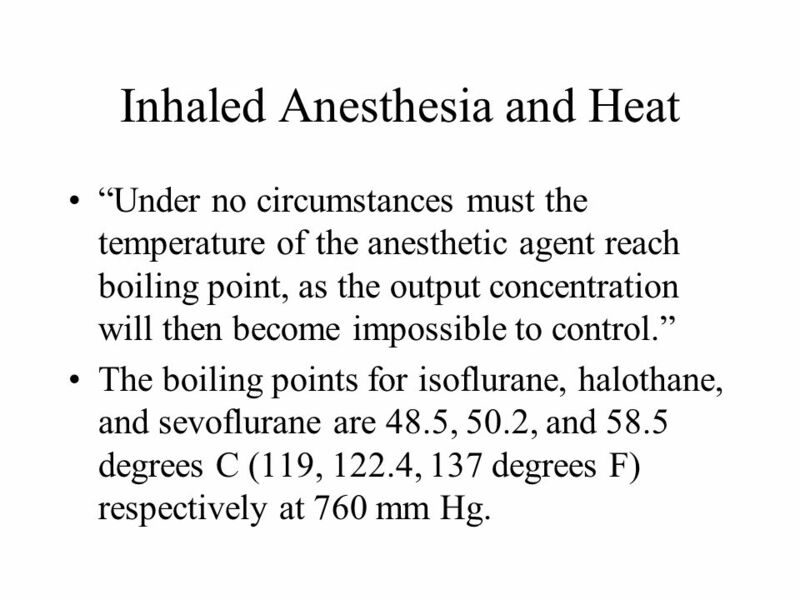 “Under no circumstances must the temperature of the anesthetic agent reach boiling point, as the output concentration will then become impossible to control.” The boiling points for isoflurane, halothane, and sevoflurane are 48.5, 50.2, and 58.5 degrees C (119, 122.4, 137 degrees F) respectively at 760 mm Hg. 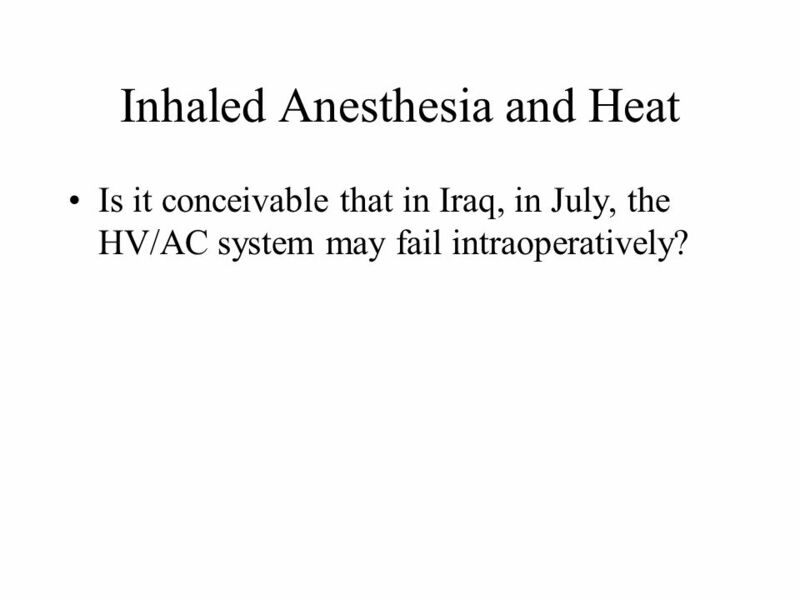 Is it conceivable that in Iraq, in July, the HV/AC system may fail intraoperatively? Ensure you are operating in a consistent climate controlled environment. 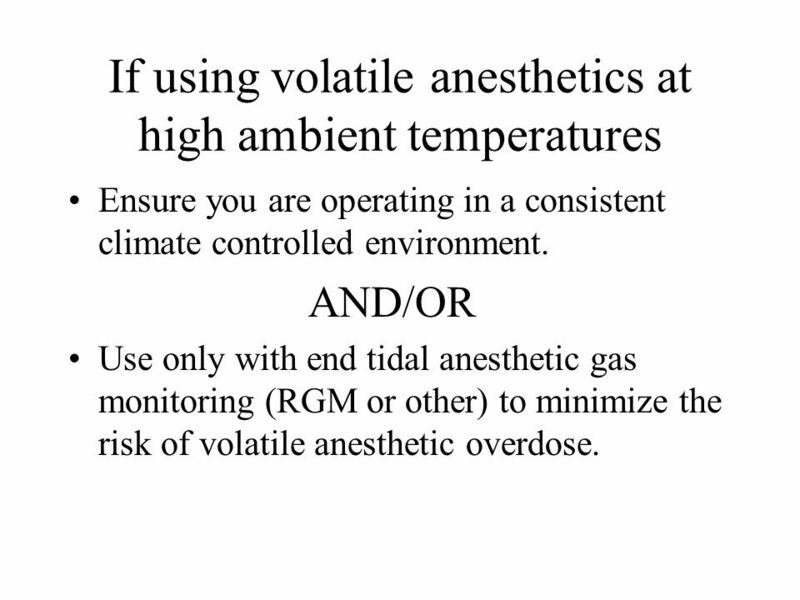 AND/OR Use only with end tidal anesthetic gas monitoring (RGM or other) to minimize the risk of volatile anesthetic overdose. 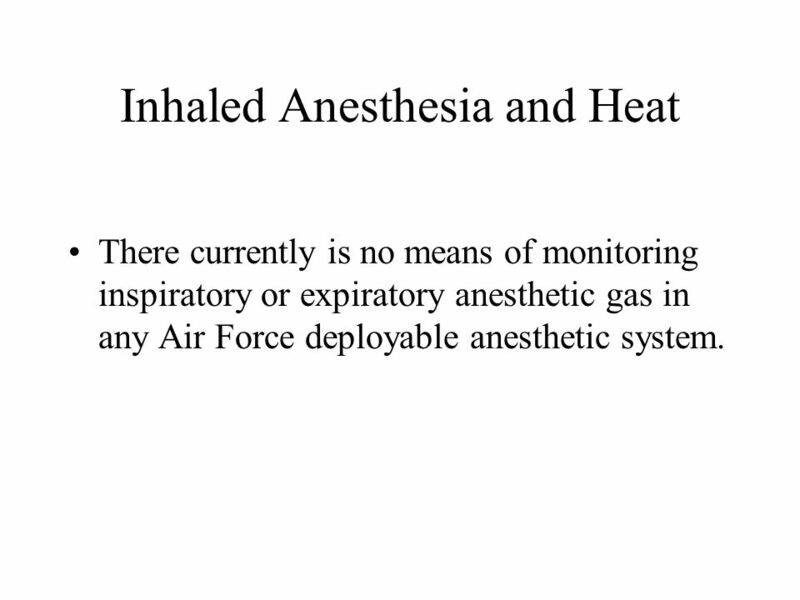 There currently is no means of monitoring inspiratory or expiratory anesthetic gas in any Air Force deployable anesthetic system. 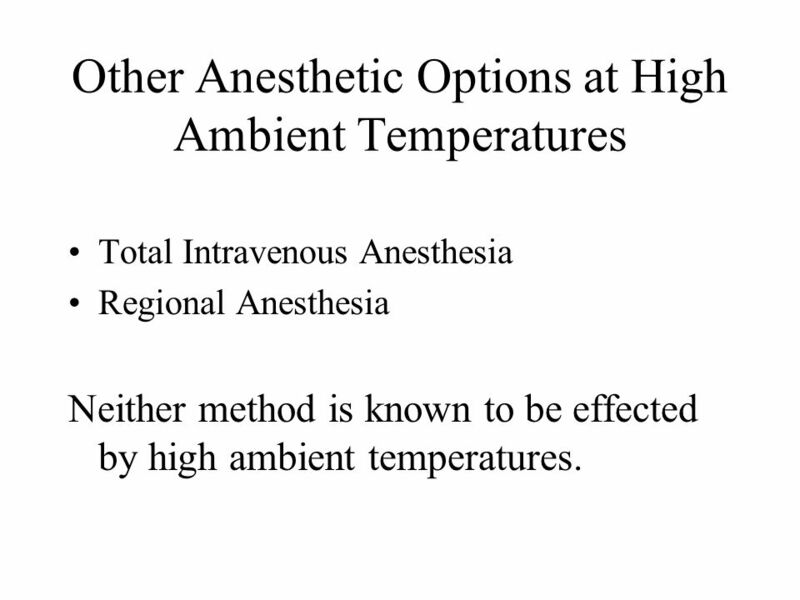 Total Intravenous Anesthesia Regional Anesthesia Neither method is known to be effected by high ambient temperatures. 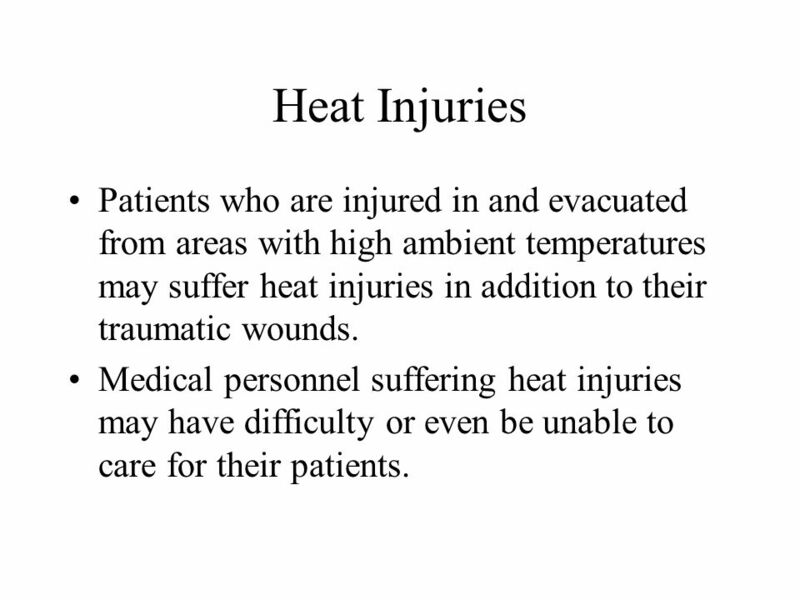 23 Heat Injuries Patients who are injured in and evacuated from areas with high ambient temperatures may suffer heat injuries in addition to their traumatic wounds. 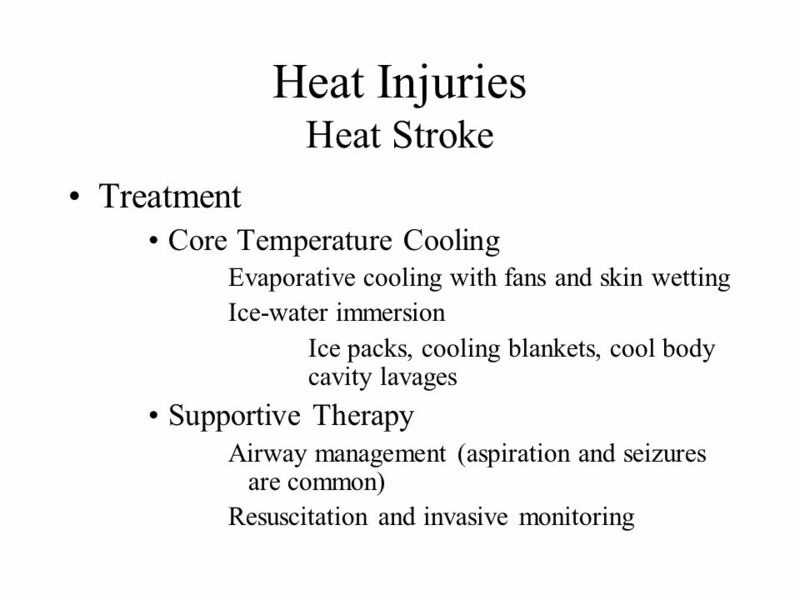 Medical personnel suffering heat injuries may have difficulty or even be unable to care for their patients. 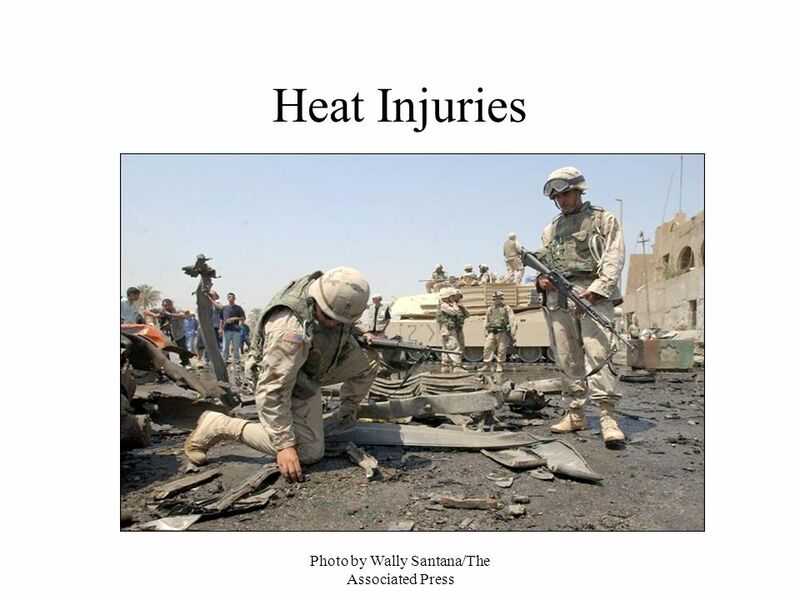 24 Heat Injuries Any condition that increases heat gain or decreases heat loss may result in a major heat illness. 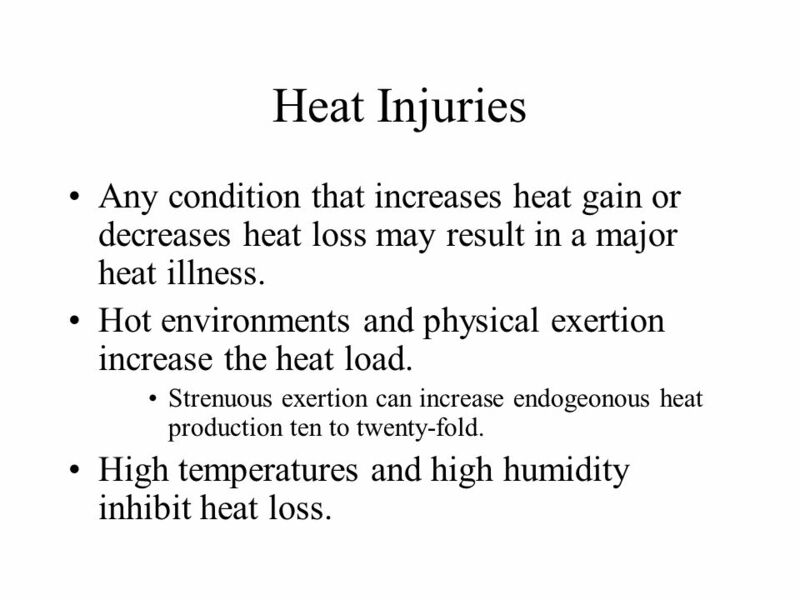 Hot environments and physical exertion increase the heat load. Strenuous exertion can increase endogeonous heat production ten to twenty-fold. High temperatures and high humidity inhibit heat loss. 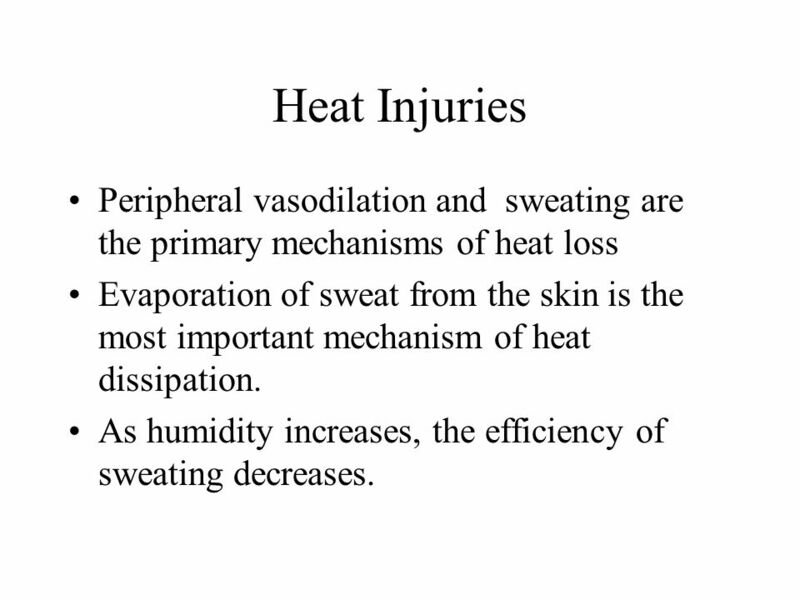 26 Heat Injuries Peripheral vasodilation and sweating are the primary mechanisms of heat loss Evaporation of sweat from the skin is the most important mechanism of heat dissipation. As humidity increases, the efficiency of sweating decreases. 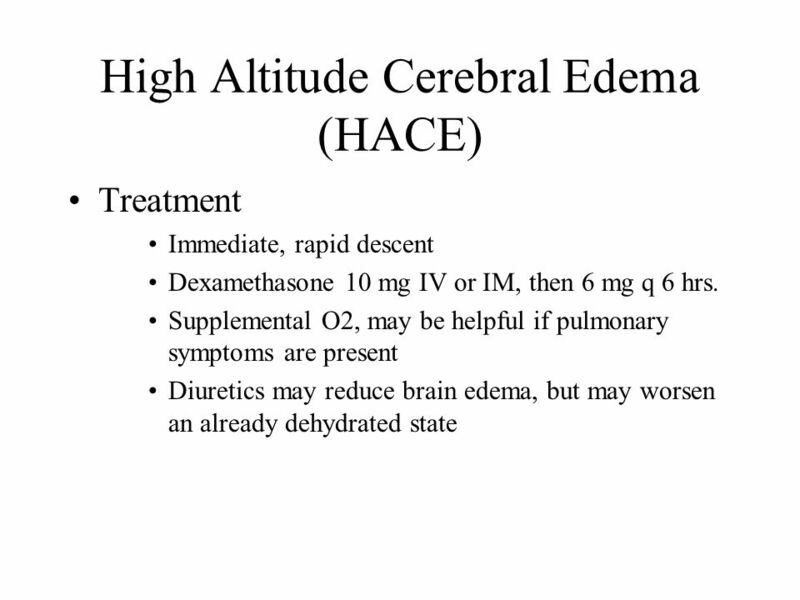 Caused by dehydration with inadequate fluid and electrolyte replacement. 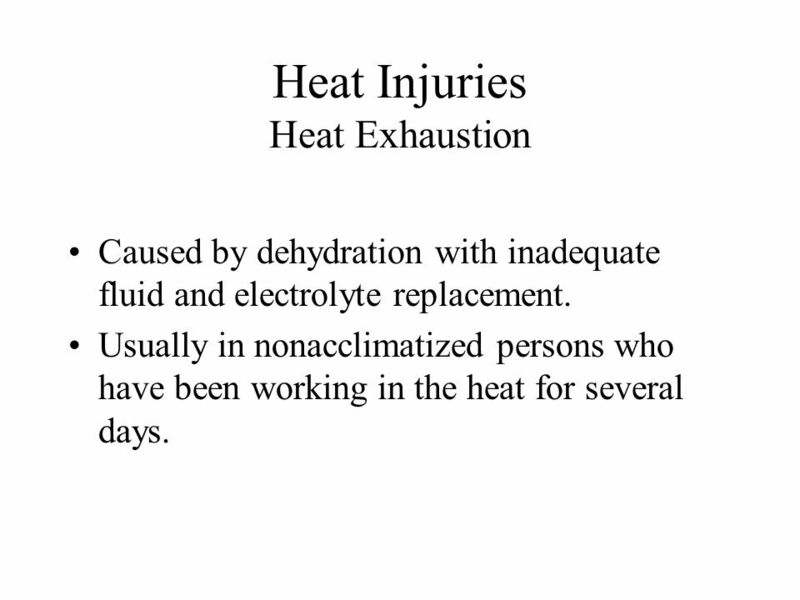 Usually in nonacclimatized persons who have been working in the heat for several days. 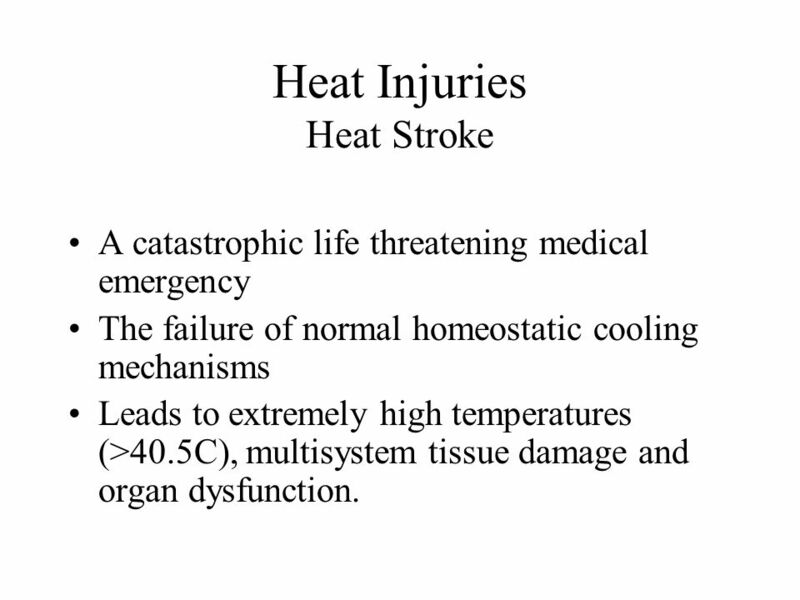 A catastrophic life threatening medical emergency The failure of normal homeostatic cooling mechanisms Leads to extremely high temperatures (>40.5C), multisystem tissue damage and organ dysfunction. 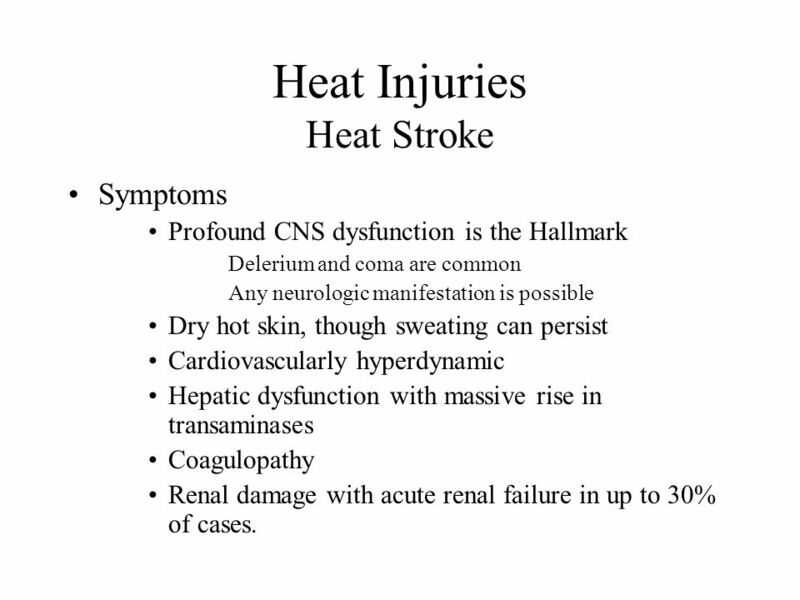 Symptoms Profound CNS dysfunction is the Hallmark Delerium and coma are common Any neurologic manifestation is possible Dry hot skin, though sweating can persist Cardiovascularly hyperdynamic Hepatic dysfunction with massive rise in transaminases Coagulopathy Renal damage with acute renal failure in up to 30% of cases. 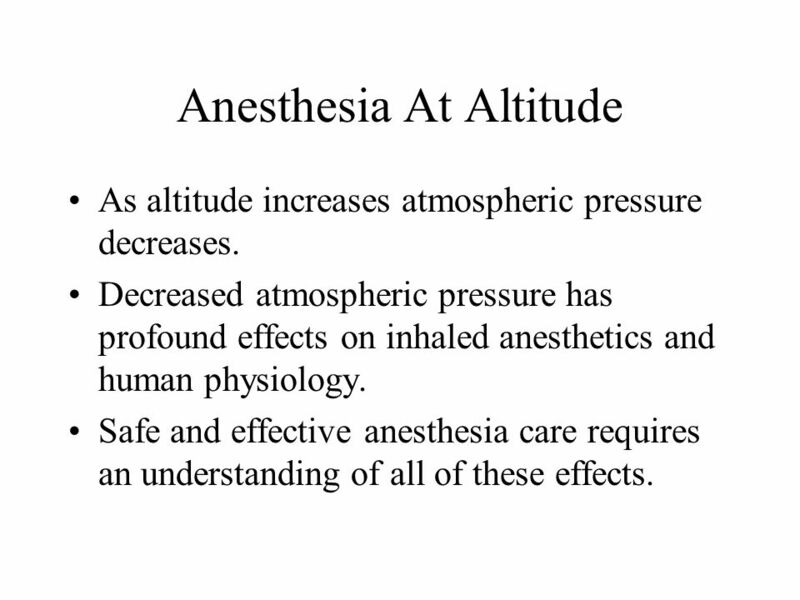 As altitude increases atmospheric pressure decreases. 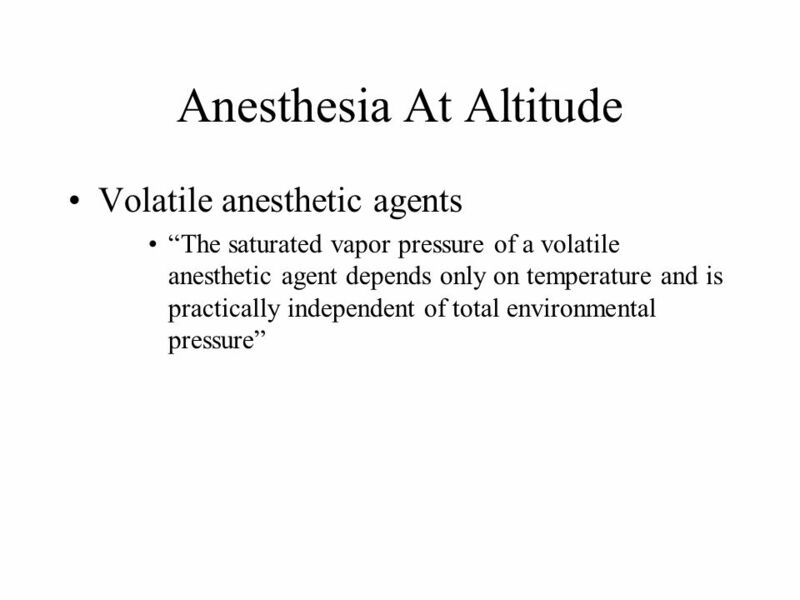 Decreased atmospheric pressure has profound effects on inhaled anesthetics and human physiology. 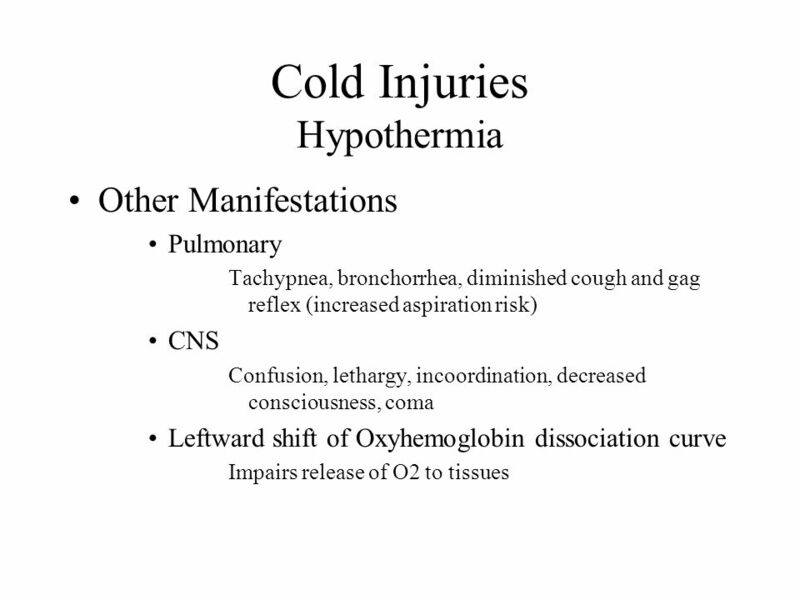 Safe and effective anesthesia care requires an understanding of all of these effects. 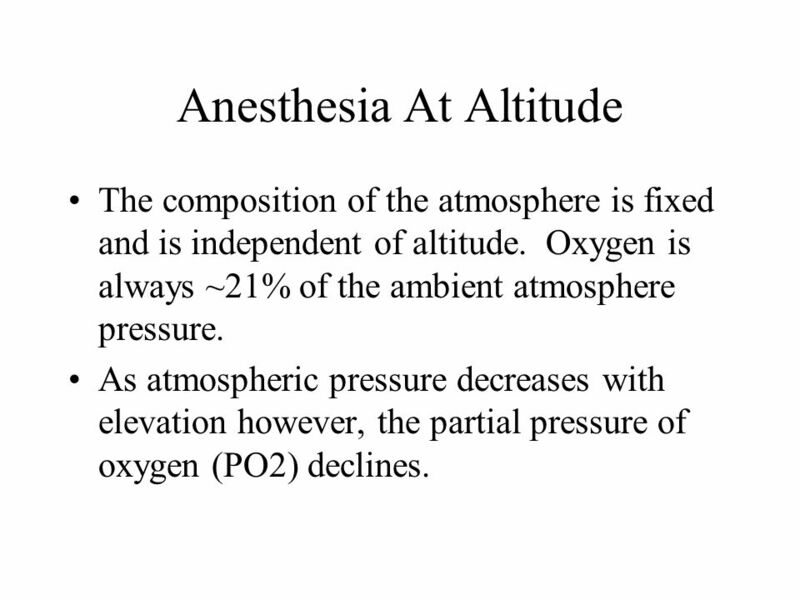 The composition of the atmosphere is fixed and is independent of altitude. 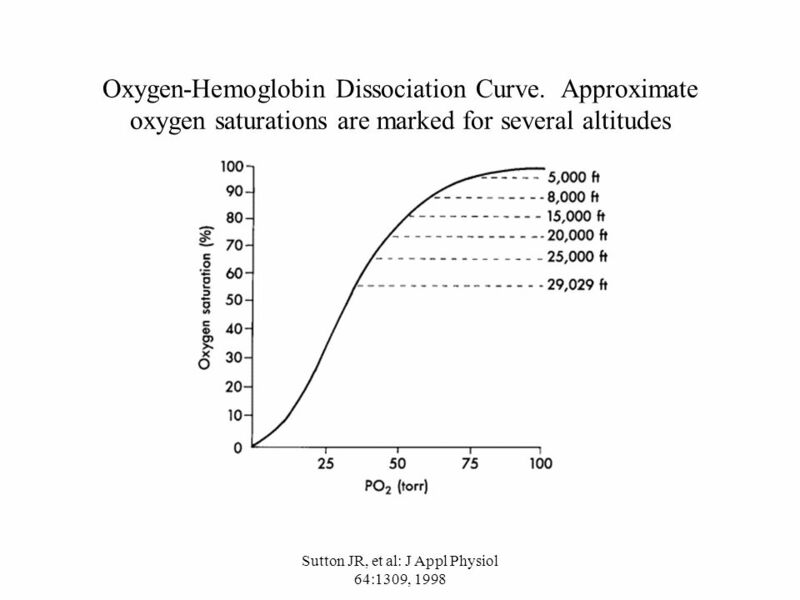 Oxygen is always ~21% of the ambient atmosphere pressure. 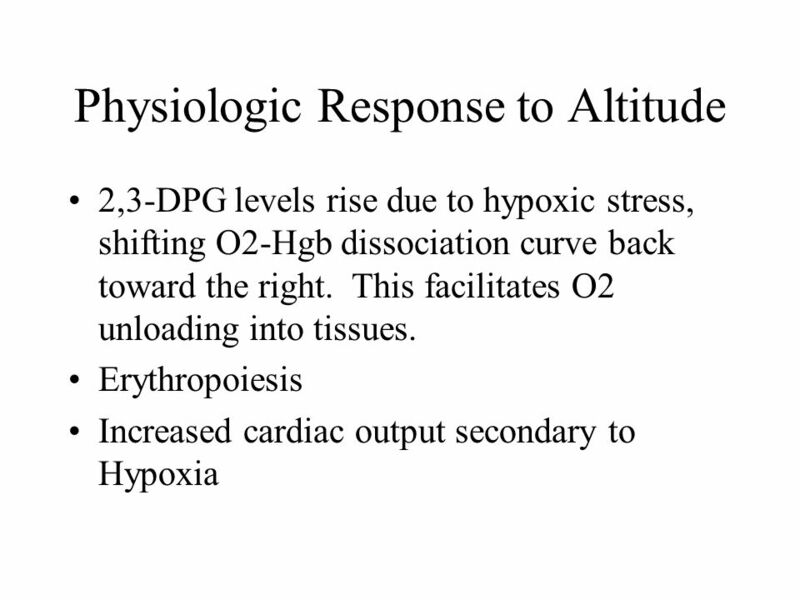 As atmospheric pressure decreases with elevation however, the partial pressure of oxygen (PO2) declines. 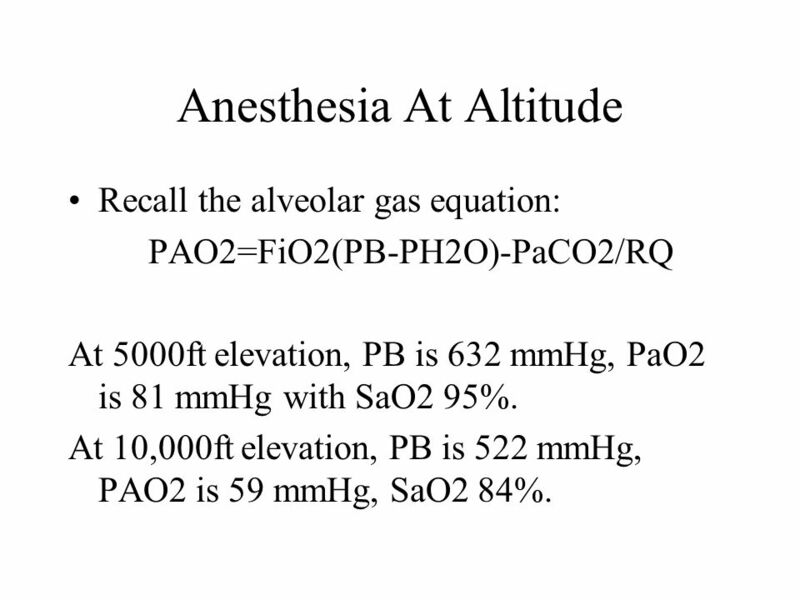 Recall the alveolar gas equation: PAO2=FiO2(PB-PH2O)-PaCO2/RQ At 5000ft elevation, PB is 632 mmHg, PaO2 is 81 mmHg with SaO2 95%. 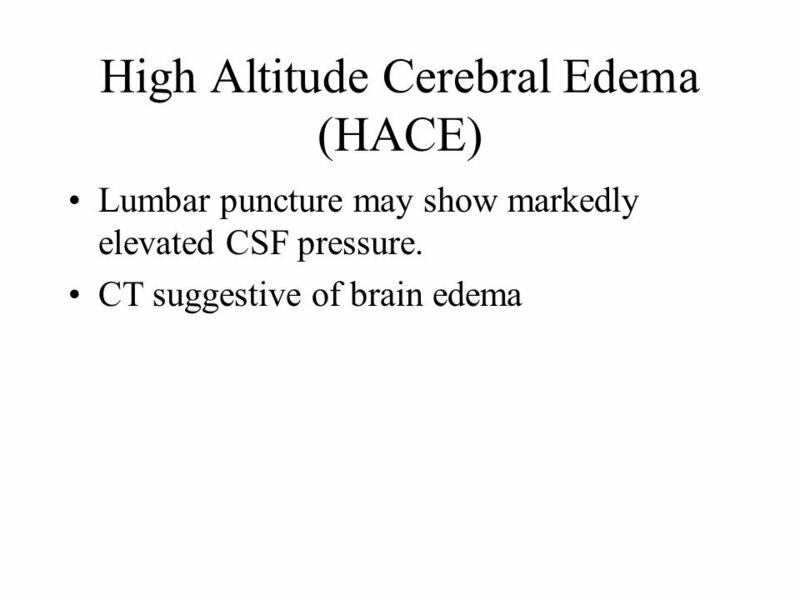 At 10,000ft elevation, PB is 522 mmHg, PAO2 is 59 mmHg, SaO2 84%. 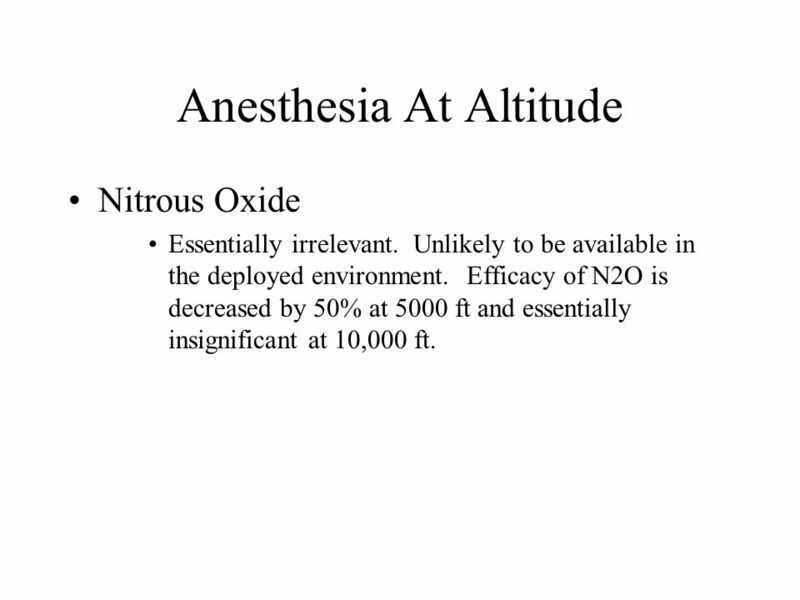 Nitrous Oxide Essentially irrelevant. Unlikely to be available in the deployed environment. 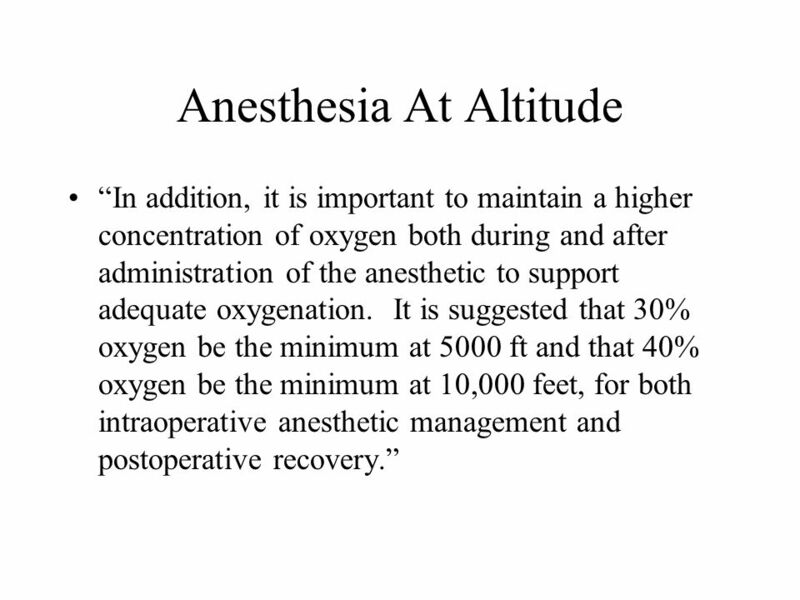 Efficacy of N2O is decreased by 50% at 5000 ft and essentially insignificant at 10,000 ft. 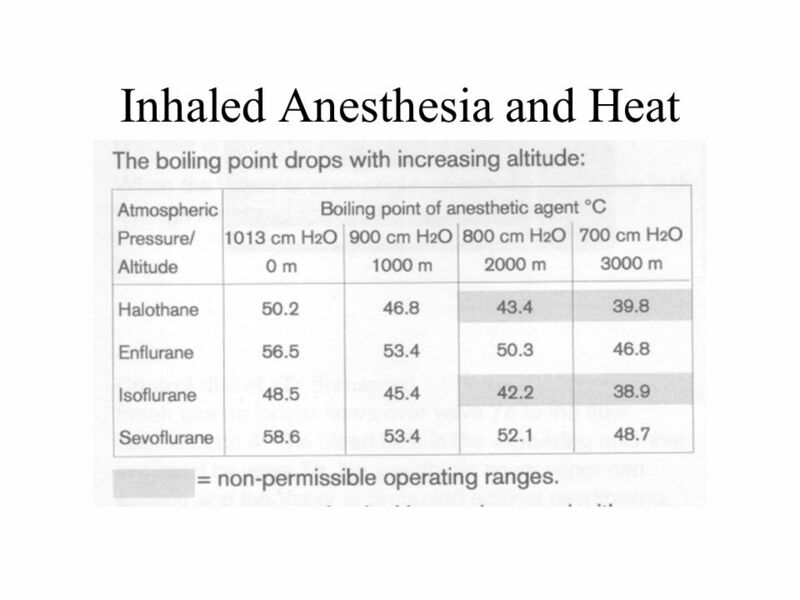 Given the relative scarcity of gaseous (or liquid) oxygen in the deployed environment it may be reasonable to conduct as much anesthesia under regional techniques. 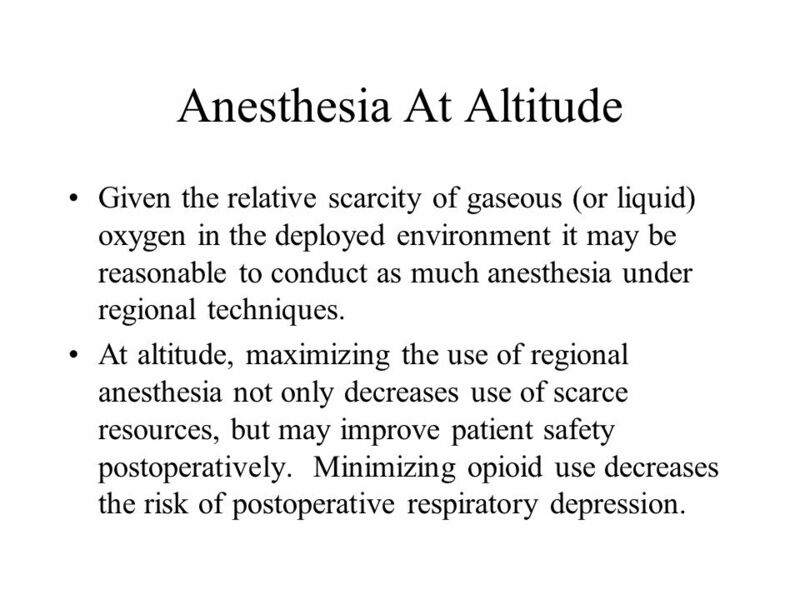 At altitude, maximizing the use of regional anesthesia not only decreases use of scarce resources, but may improve patient safety postoperatively. Minimizing opioid use decreases the risk of postoperative respiratory depression. 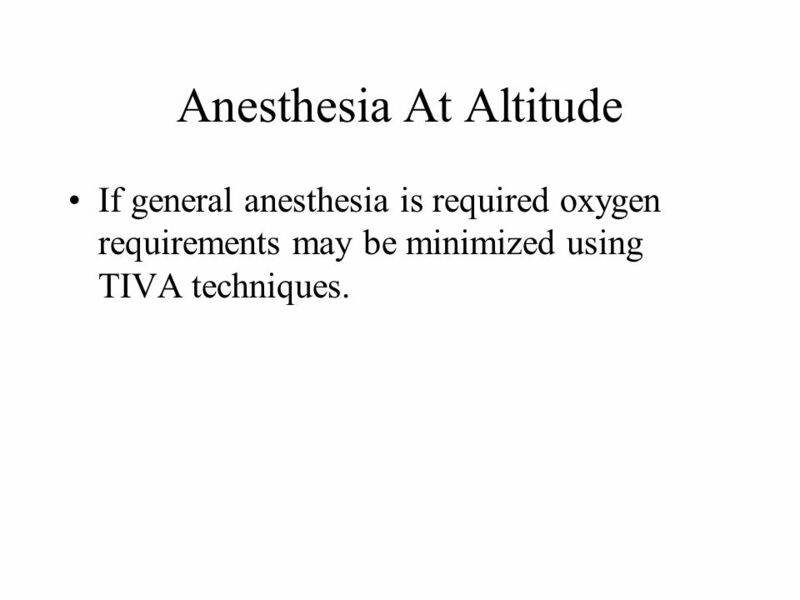 If general anesthesia is required oxygen requirements may be minimized using TIVA techniques. 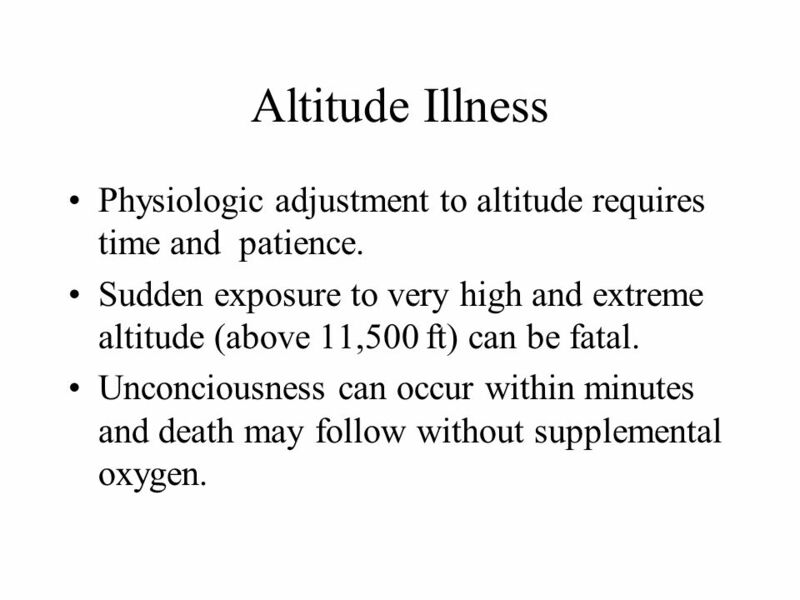 44 Altitude Illness Physiologic adjustment to altitude requires time and patience. 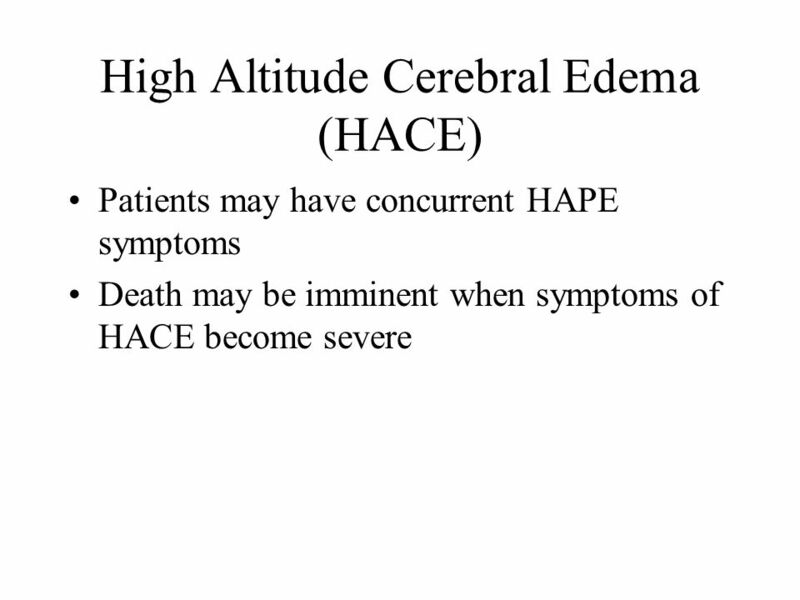 Sudden exposure to very high and extreme altitude (above 11,500 ft) can be fatal. Unconciousness can occur within minutes and death may follow without supplemental oxygen. Lower PB leads to lower PAO2, decreased SAO2 and PaO2 and elevated Alveolar-arterial oxygen gradients. 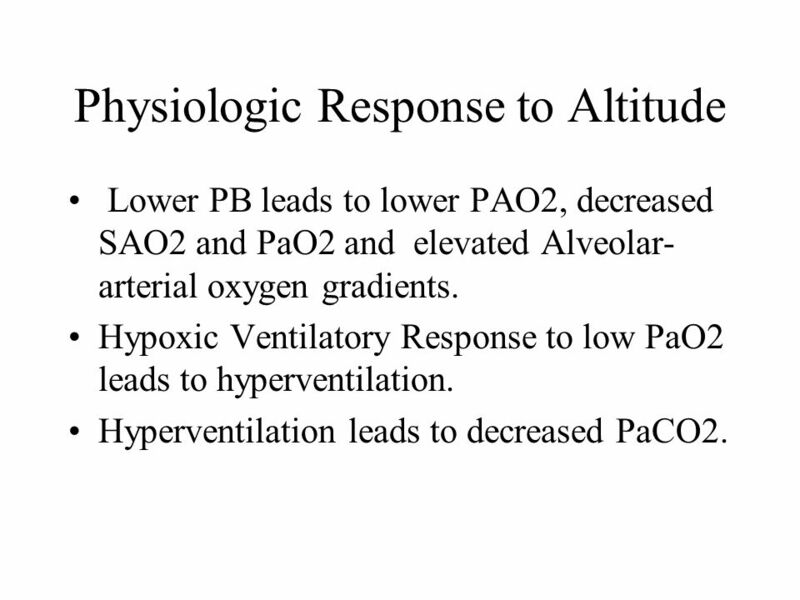 Hypoxic Ventilatory Response to low PaO2 leads to hyperventilation. 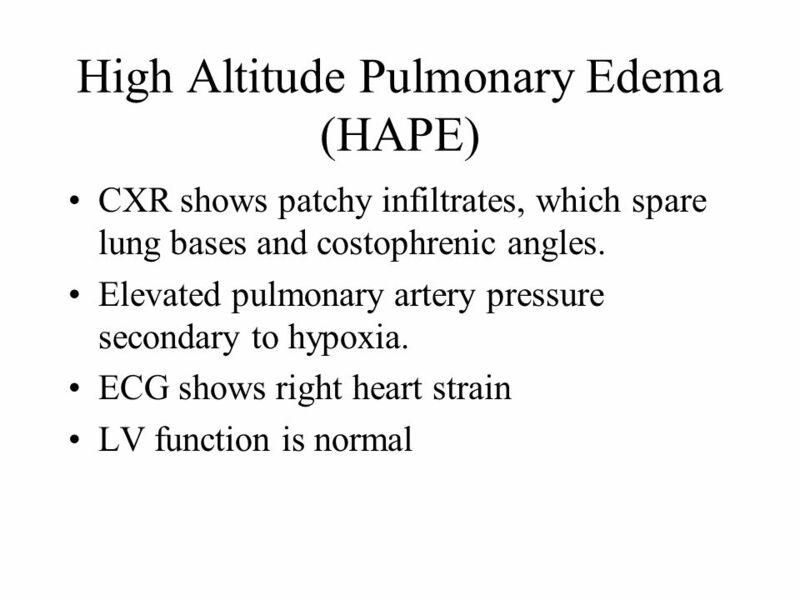 Hyperventilation leads to decreased PaCO2. 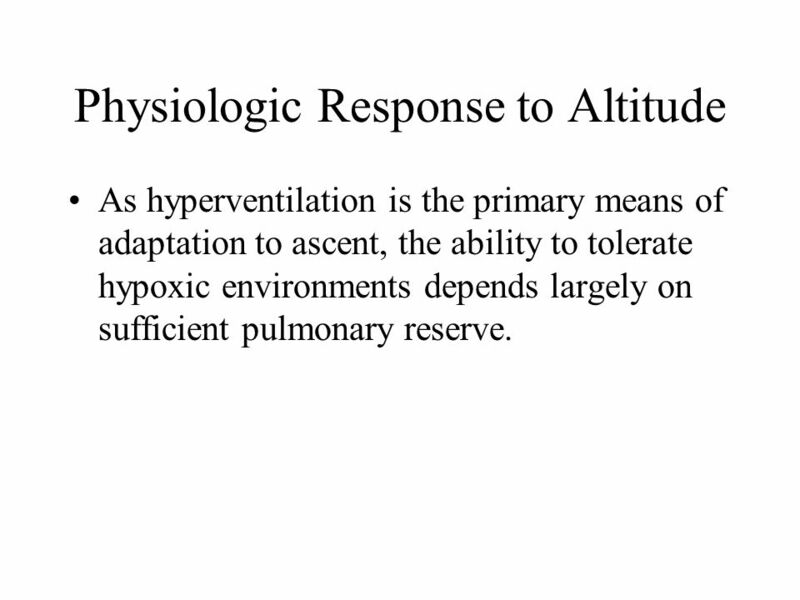 As hyperventilation is the primary means of adaptation to ascent, the ability to tolerate hypoxic environments depends largely on sufficient pulmonary reserve. 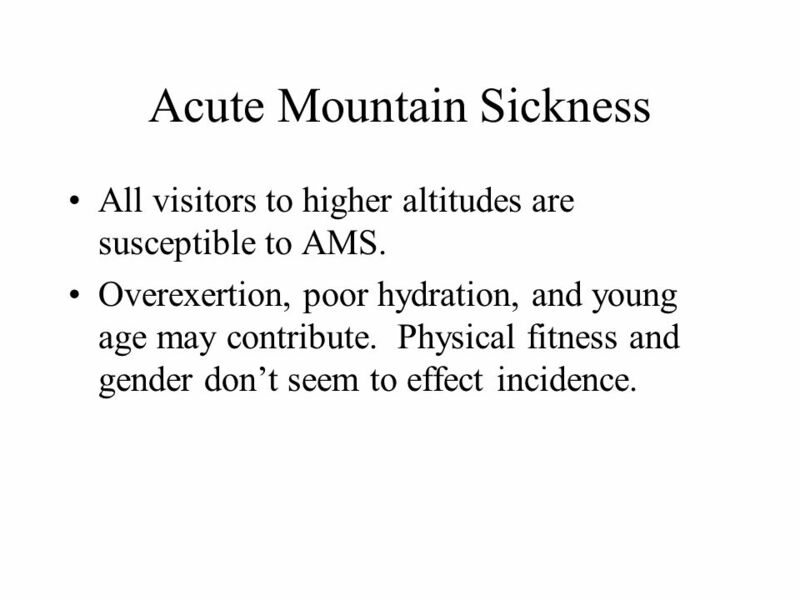 All visitors to higher altitudes are susceptible to AMS. Overexertion, poor hydration, and young age may contribute. Physical fitness and gender don’t seem to effect incidence. 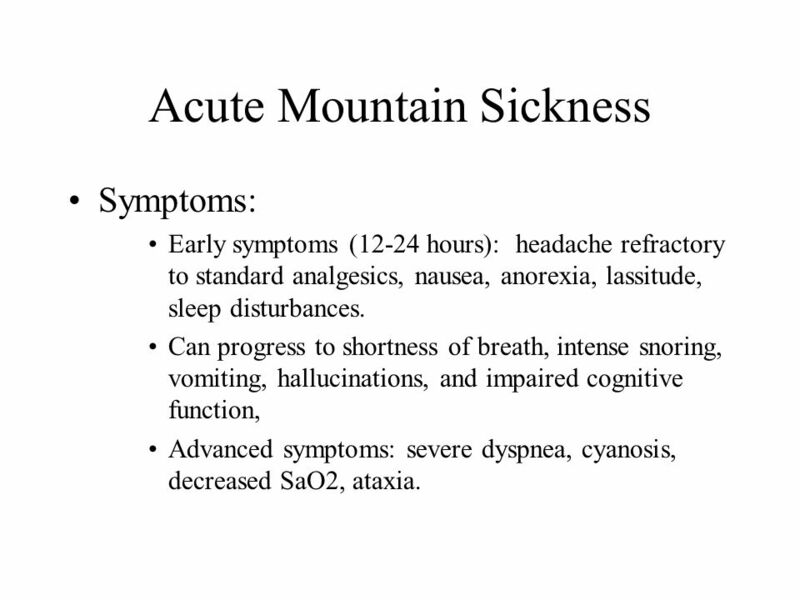 Symptoms: Early symptoms (12-24 hours): headache refractory to standard analgesics, nausea, anorexia, lassitude, sleep disturbances. Can progress to shortness of breath, intense snoring, vomiting, hallucinations, and impaired cognitive function, Advanced symptoms: severe dyspnea, cyanosis, decreased SaO2, ataxia. 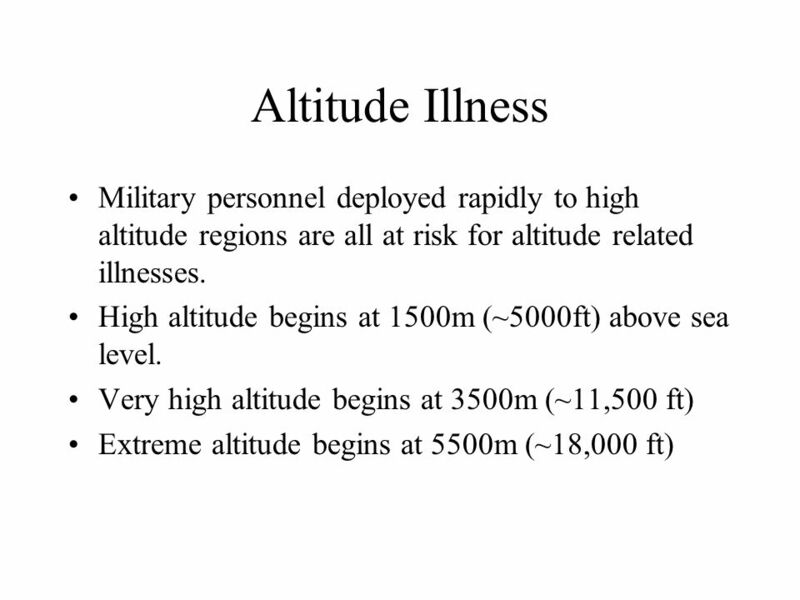 Prevention Ascend slowly, not always possible in military ops Daily altitude gain of no more than 300m above 3000m. After ascending 1000m spend two consecutive nights. 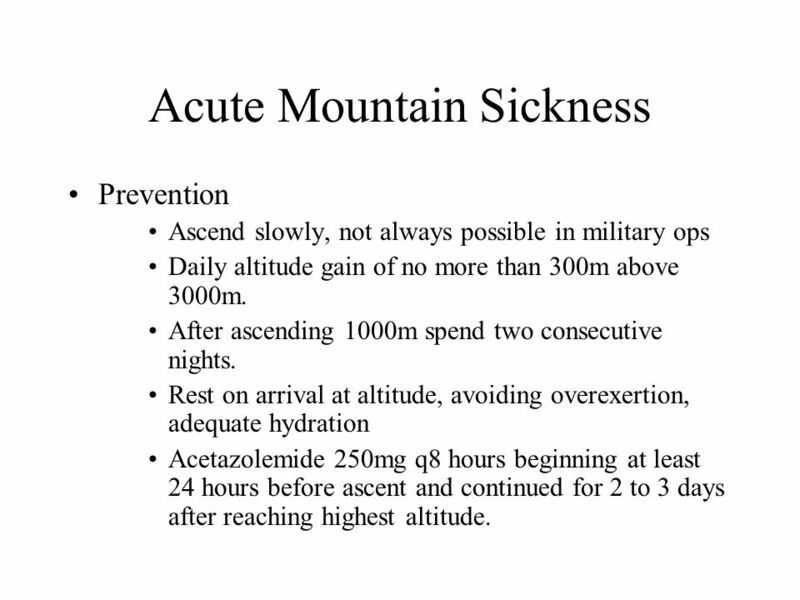 Rest on arrival at altitude, avoiding overexertion, adequate hydration Acetazolemide 250mg q8 hours beginning at least 24 hours before ascent and continued for 2 to 3 days after reaching highest altitude. 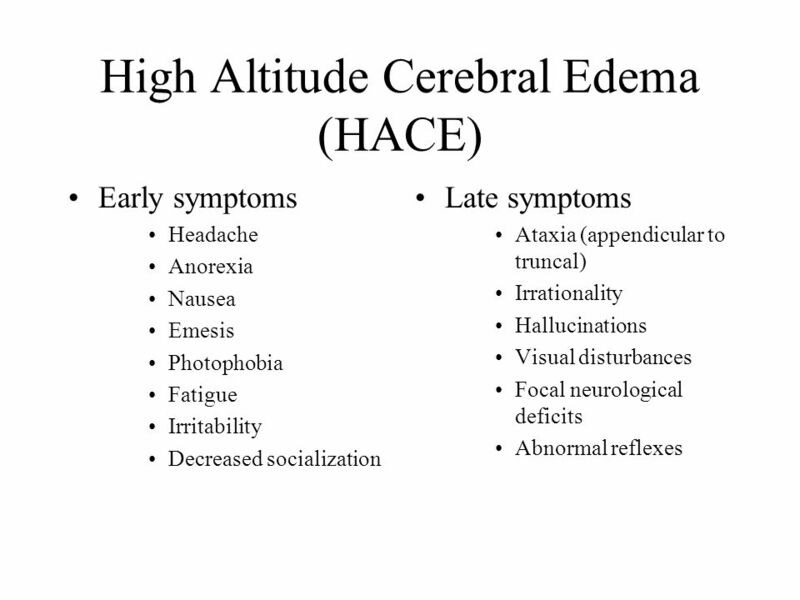 A malignant form of AMS with similar early symptoms. Life threatening. 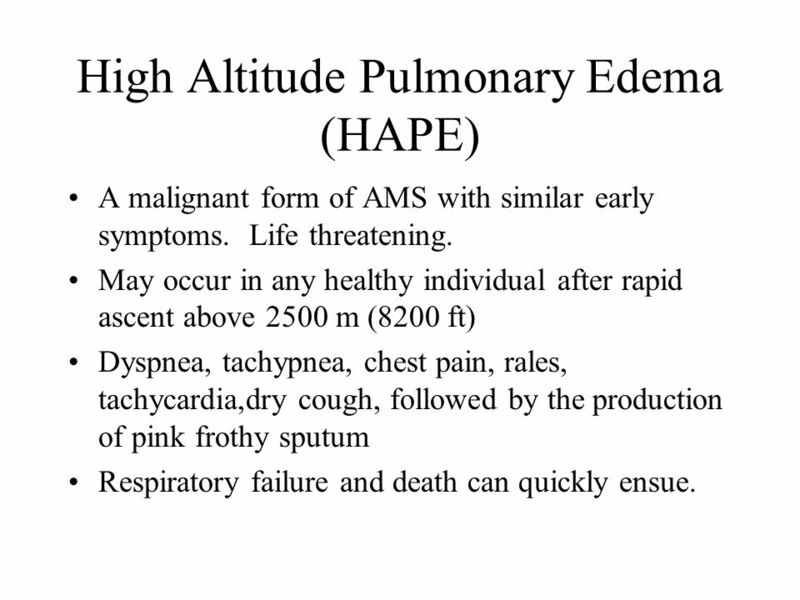 May occur in any healthy individual after rapid ascent above 2500 m (8200 ft) Dyspnea, tachypnea, chest pain, rales, tachycardia,dry cough, followed by the production of pink frothy sputum Respiratory failure and death can quickly ensue. 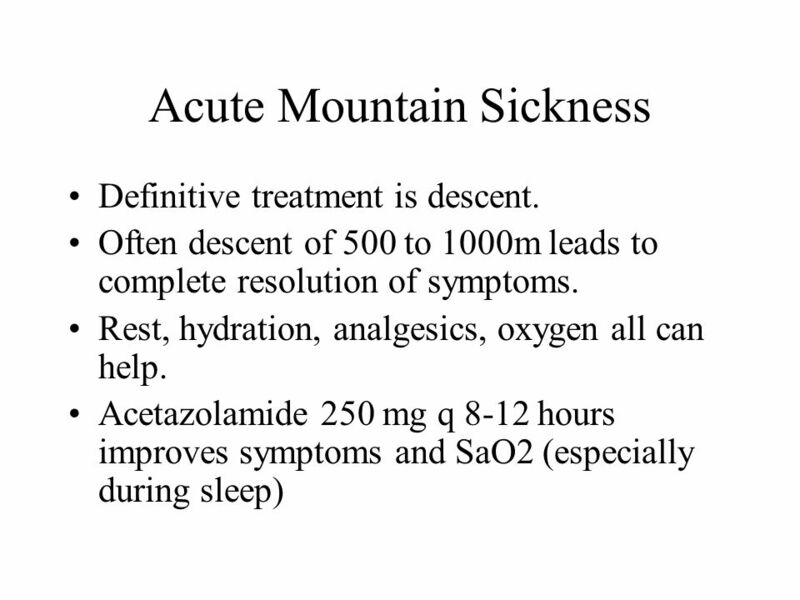 Another severe form of AMS, also be life threatening. 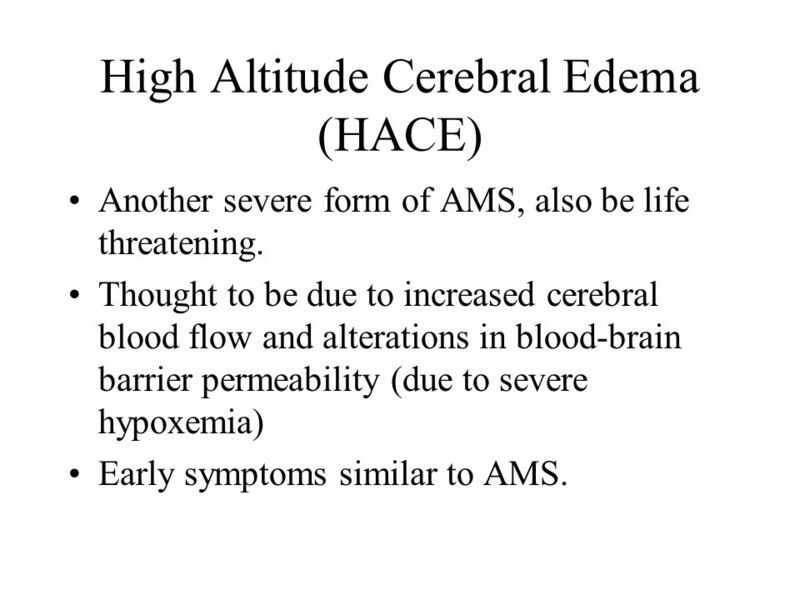 Thought to be due to increased cerebral blood flow and alterations in blood-brain barrier permeability (due to severe hypoxemia) Early symptoms similar to AMS. 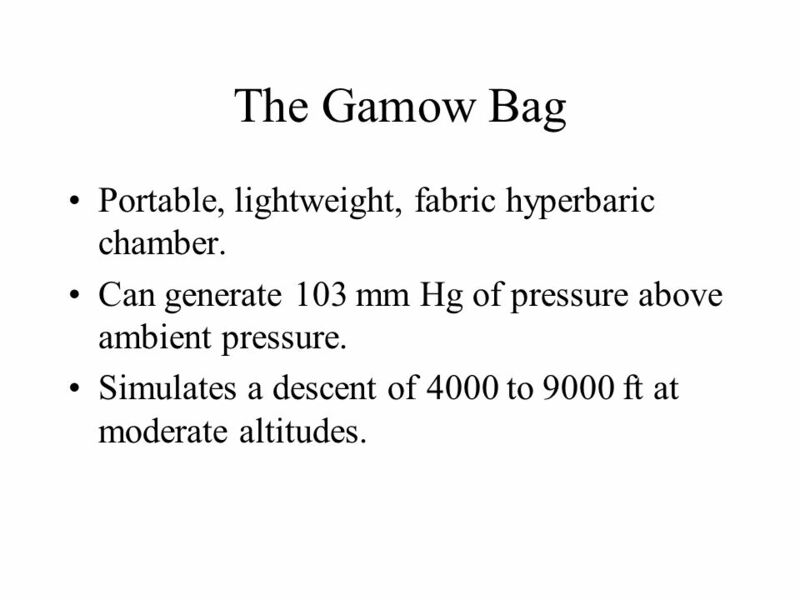 62 The Gamow Bag Portable, lightweight, fabric hyperbaric chamber. 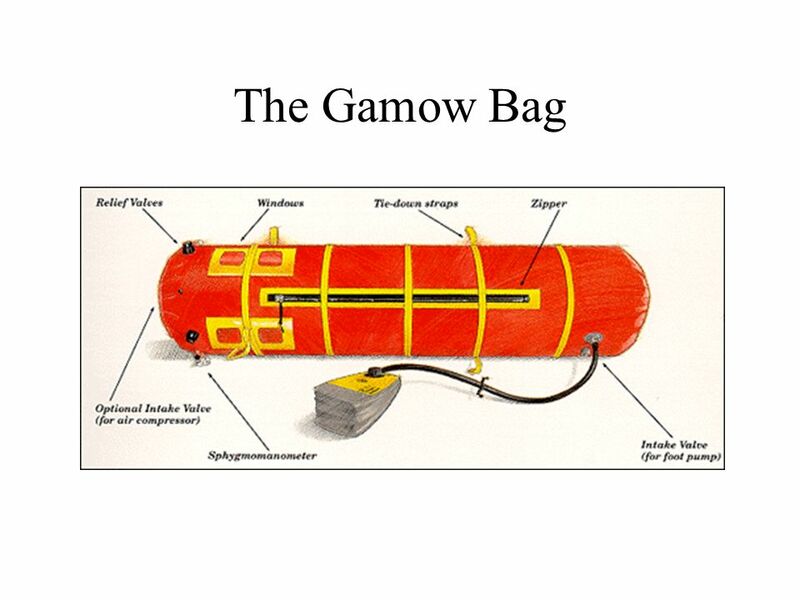 Can generate 103 mm Hg of pressure above ambient pressure. Simulates a descent of 4000 to 9000 ft at moderate altitudes. 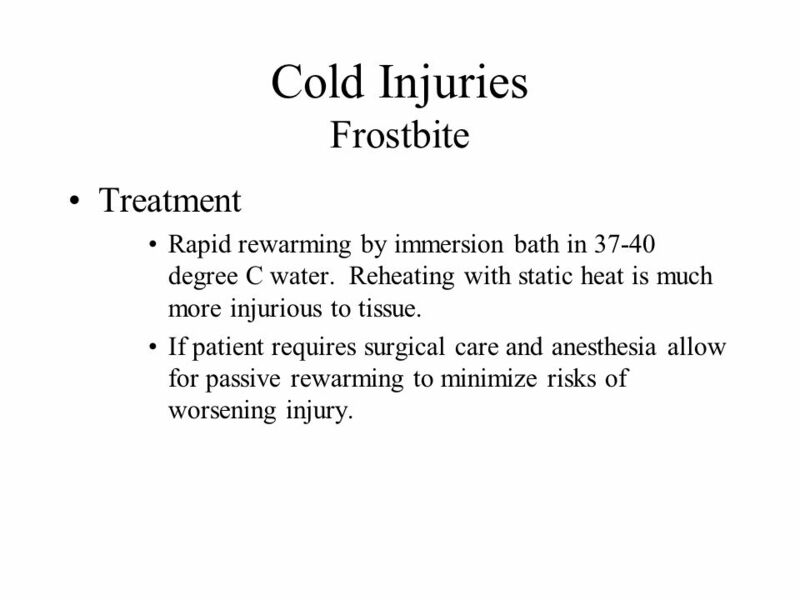 Treatment Rapid rewarming by immersion bath in degree C water. 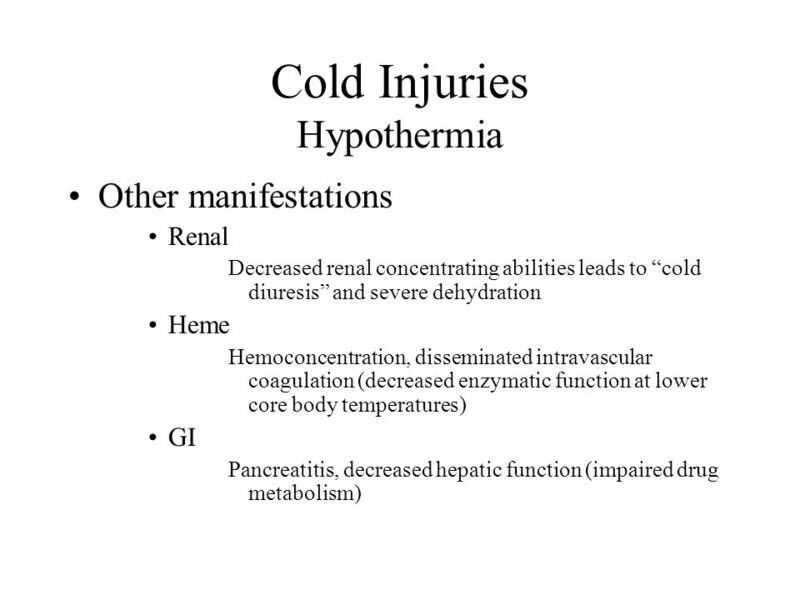 Reheating with static heat is much more injurious to tissue. 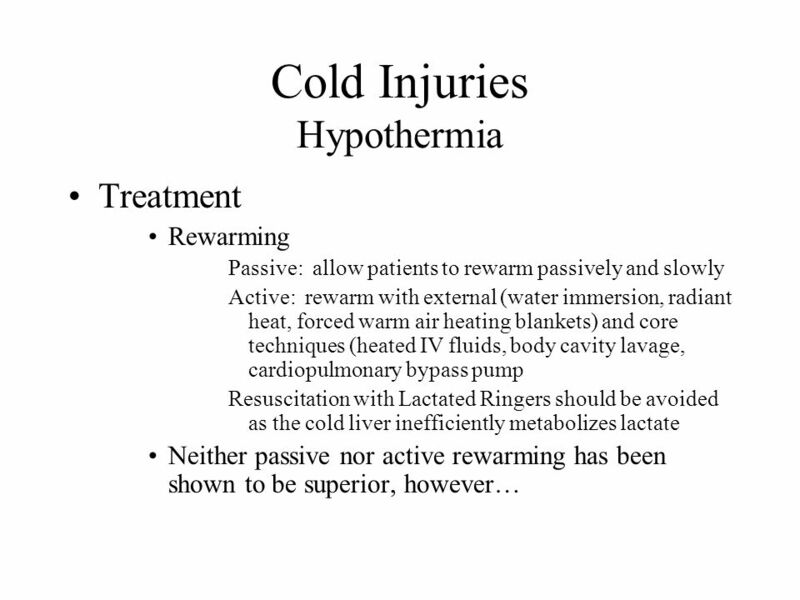 If patient requires surgical care and anesthesia allow for passive rewarming to minimize risks of worsening injury. 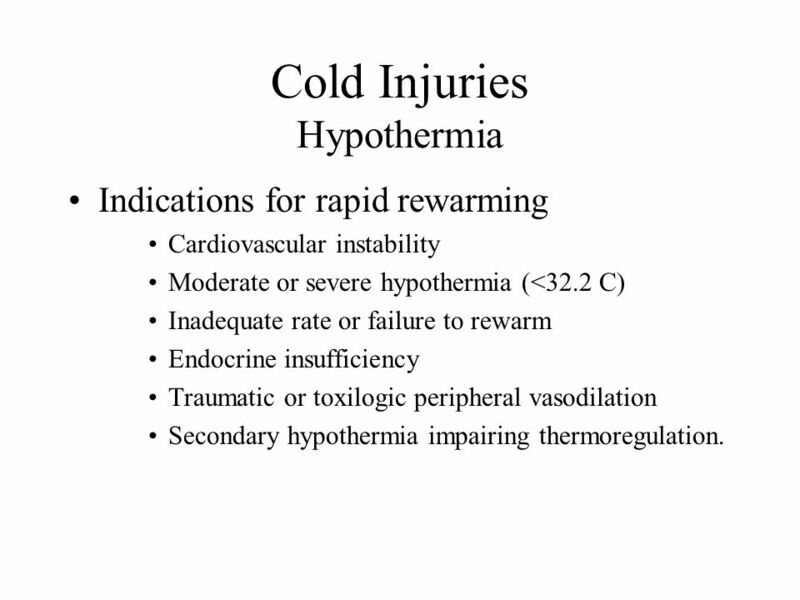 Indications for rapid rewarming Cardiovascular instability Moderate or severe hypothermia (<32.2 C) Inadequate rate or failure to rewarm Endocrine insufficiency Traumatic or toxilogic peripheral vasodilation Secondary hypothermia impairing thermoregulation. 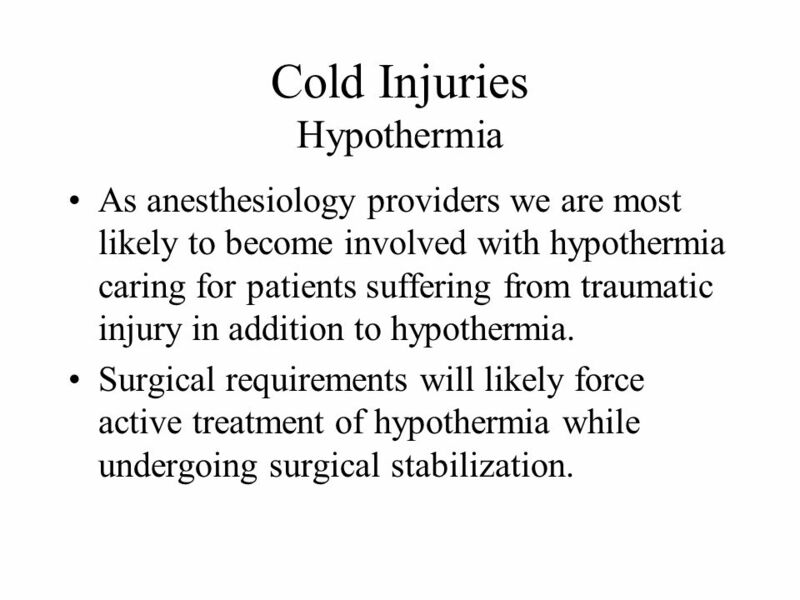 As anesthesiology providers we are most likely to become involved with hypothermia caring for patients suffering from traumatic injury in addition to hypothermia. 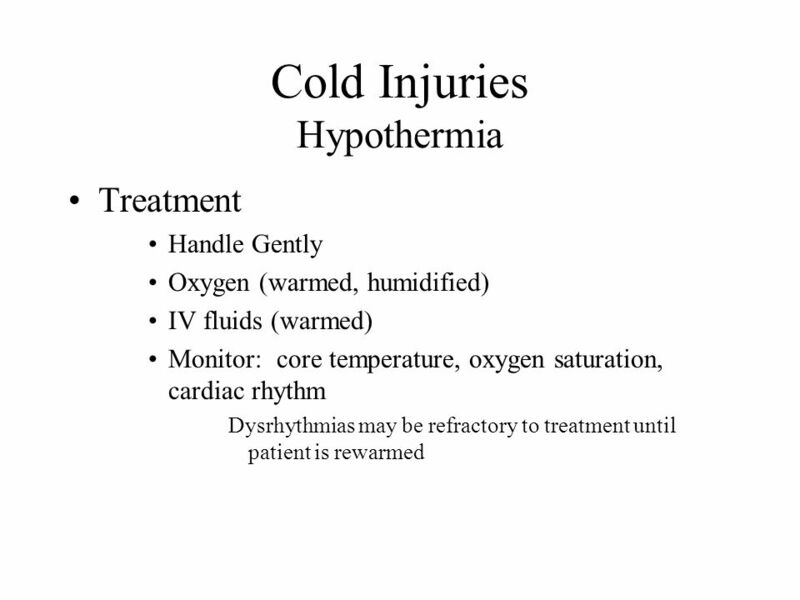 Surgical requirements will likely force active treatment of hypothermia while undergoing surgical stabilization. 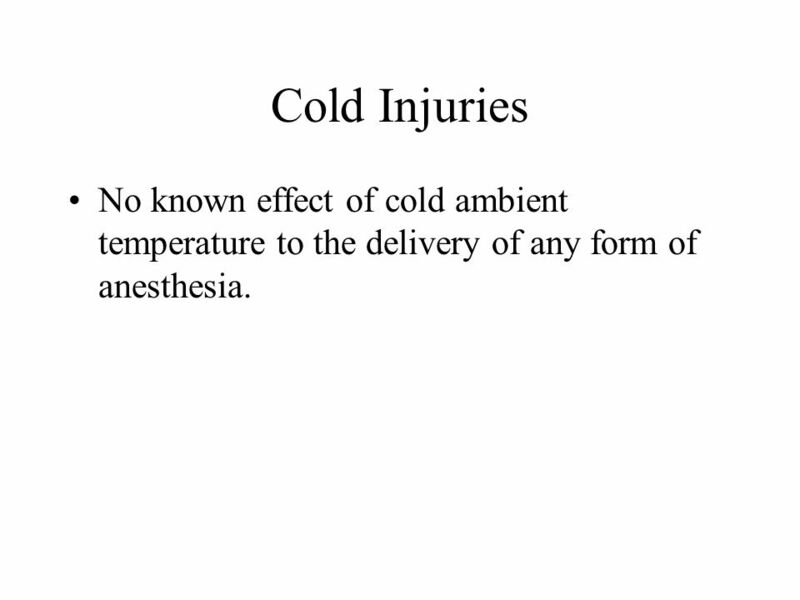 76 Cold Injuries No known effect of cold ambient temperature to the delivery of any form of anesthesia. 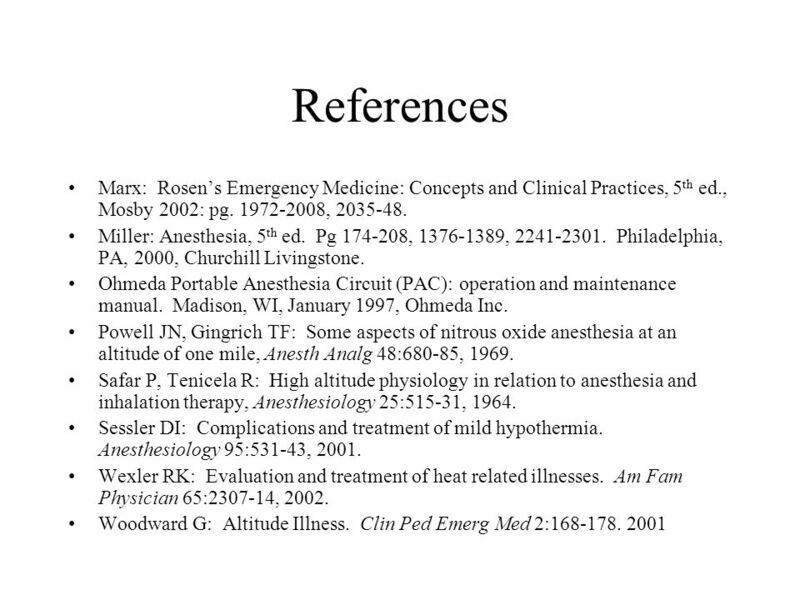 77 References Buckenmaier CC, Lee EH, Shields CH, Sampson JB, Chiles JH: Regional anesthesia in austere environments. Reg Anesth and Pain Med 28: ,2003. 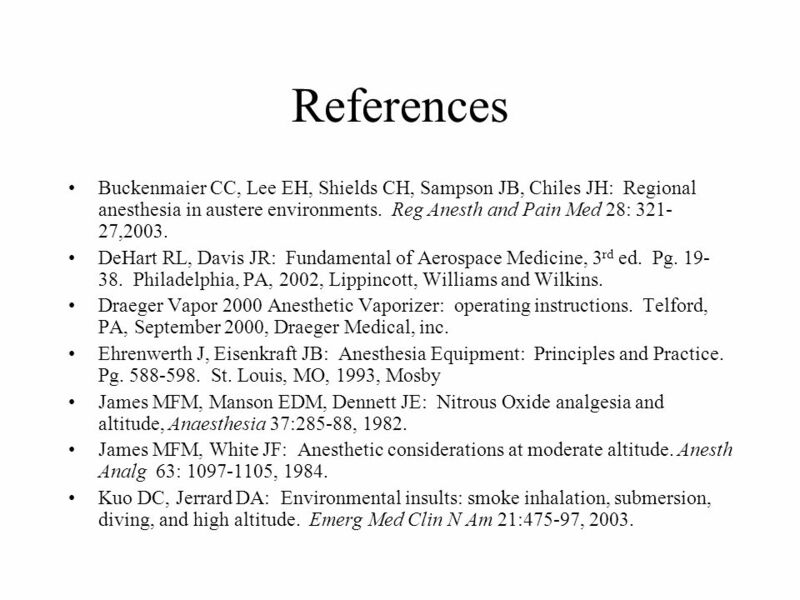 DeHart RL, Davis JR: Fundamental of Aerospace Medicine, 3rd ed. Pg Philadelphia, PA, 2002, Lippincott, Williams and Wilkins. 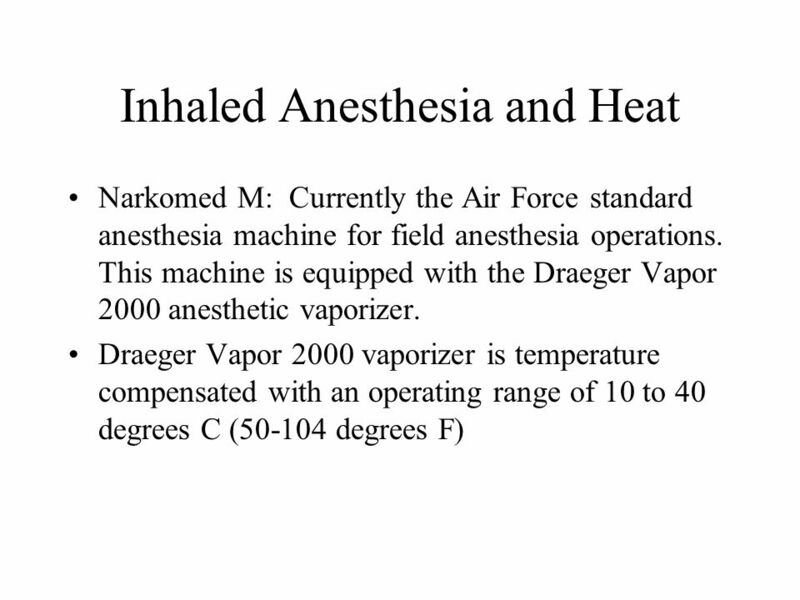 Draeger Vapor 2000 Anesthetic Vaporizer: operating instructions. 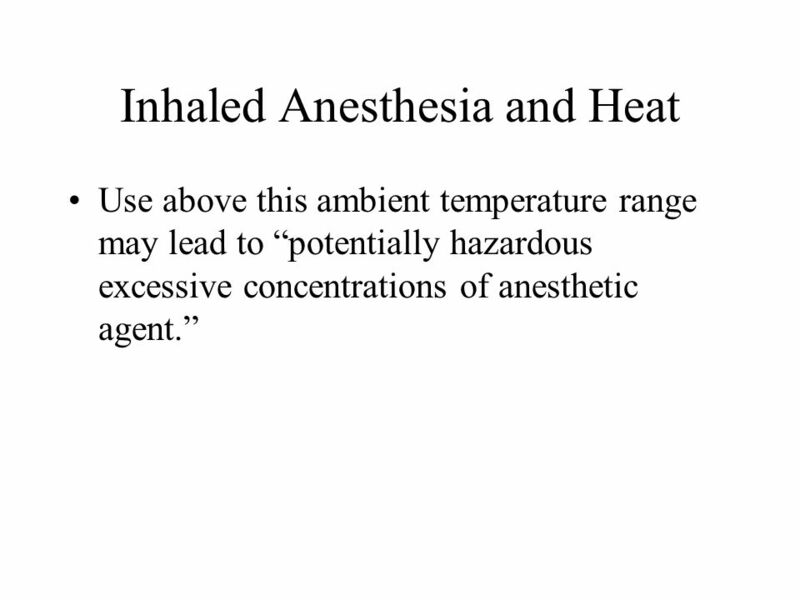 Telford, PA, September 2000, Draeger Medical, inc. Ehrenwerth J, Eisenkraft JB: Anesthesia Equipment: Principles and Practice. 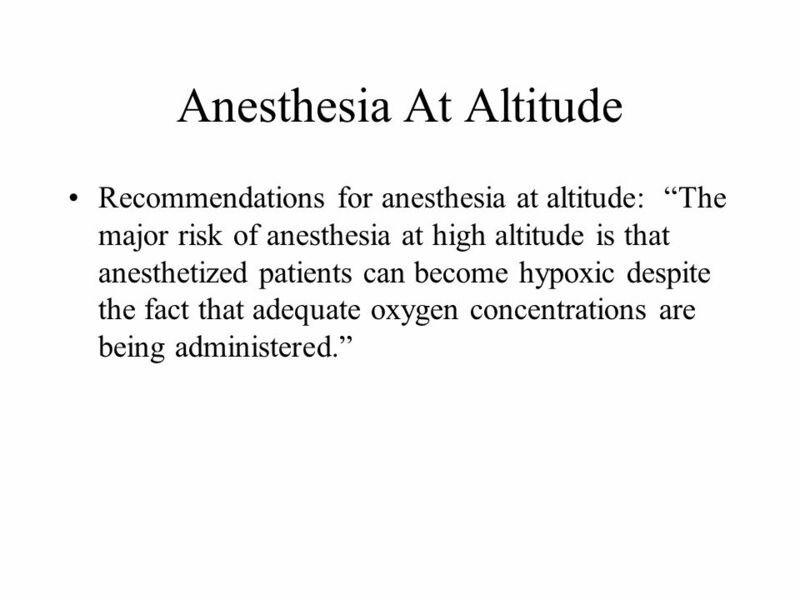 Pg St. Louis, MO, 1993, Mosby James MFM, Manson EDM, Dennett JE: Nitrous Oxide analgesia and altitude, Anaesthesia 37:285-88, 1982. 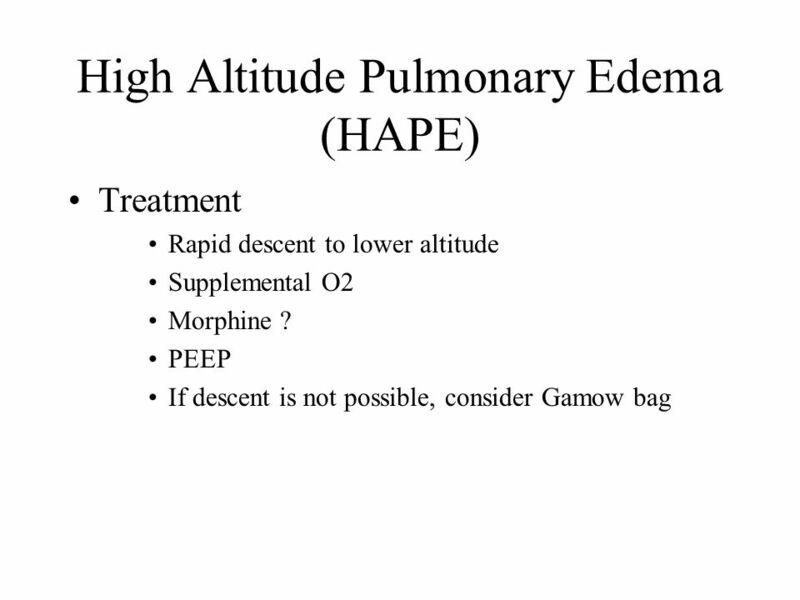 James MFM, White JF: Anesthetic considerations at moderate altitude. Anesth Analg 63: , 1984. Kuo DC, Jerrard DA: Environmental insults: smoke inhalation, submersion, diving, and high altitude. Emerg Med Clin N Am 21:475-97, 2003. 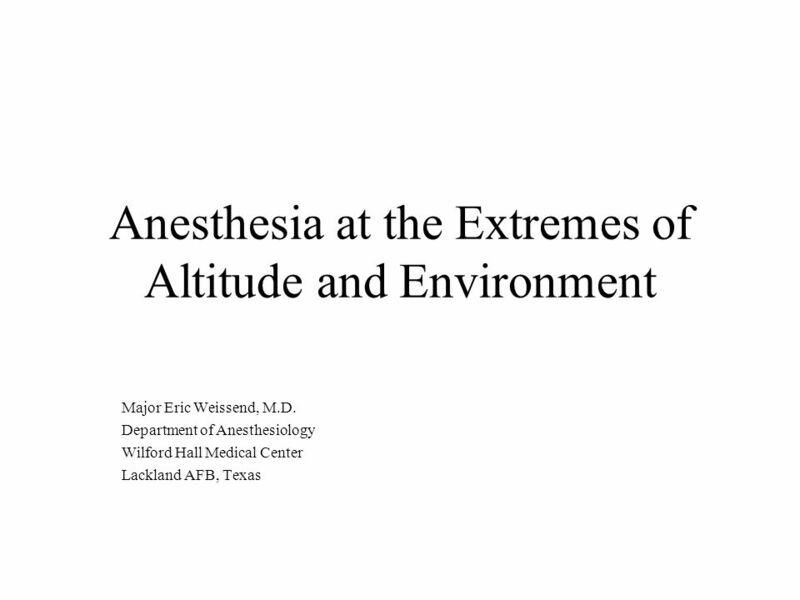 Download ppt "Anesthesia at the Extremes of Altitude and Environment"
10. a) Explain, and if possible demonstrate, how to shelter if you are in difficulty when out walking. 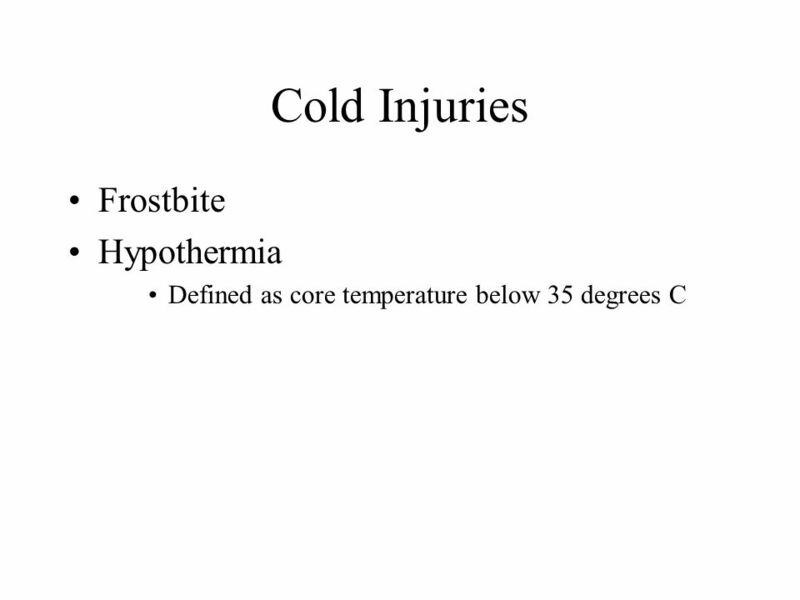 AND b) Explain how to deal with and avoid hypothermia. Mike McDonnell, MD. HUSAR team gets deployed to the collapse of an office tower in downtown Toronto people are trapped mid August, 30ºC with Humidex feels. 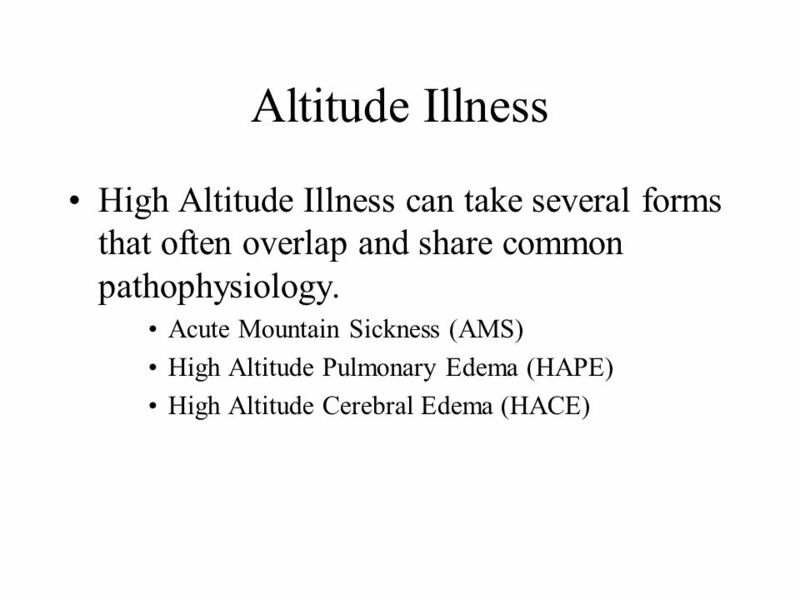 1 Exercise and Altitude Moderate altitude 1500m (5000ft) –Dec max O2 consumption Extreme altitude 6000m(20000ft) –Progressive deterioration - death Fig. 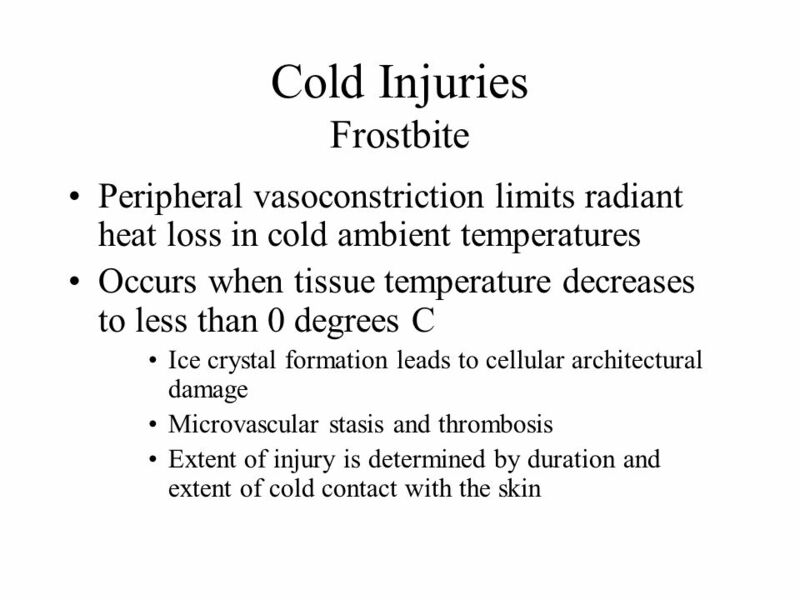 Environmental Emergencies Heat & Cold emergencies. 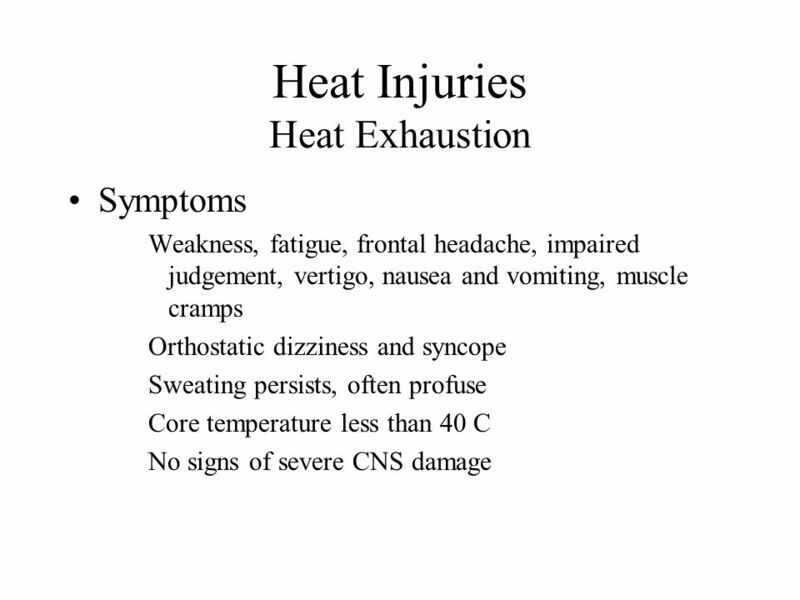 Heat Stress. Objectives Definitions Causal factors Heat disorders and health effects Prevention and control Engineering controls PPE. 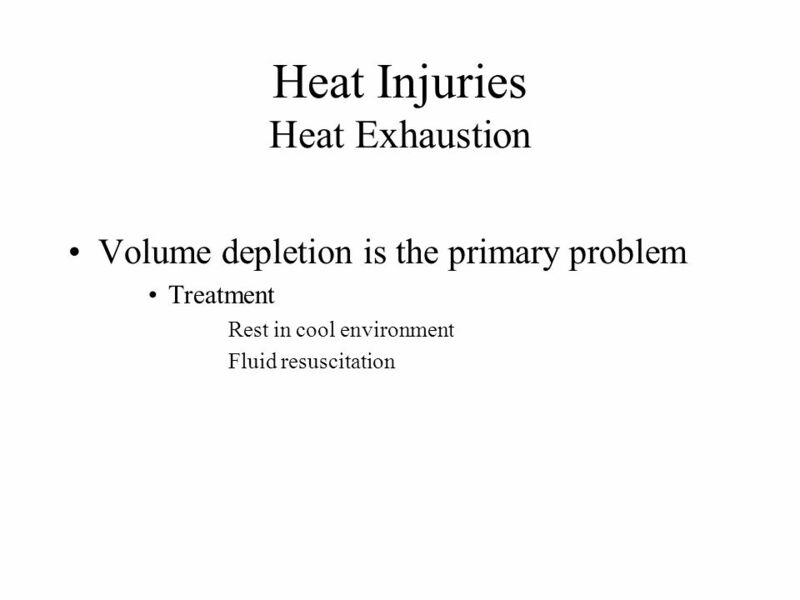 Exercise Thermoregulation, Fluid Balance, and Rehydration Chapter 10 Part 2. 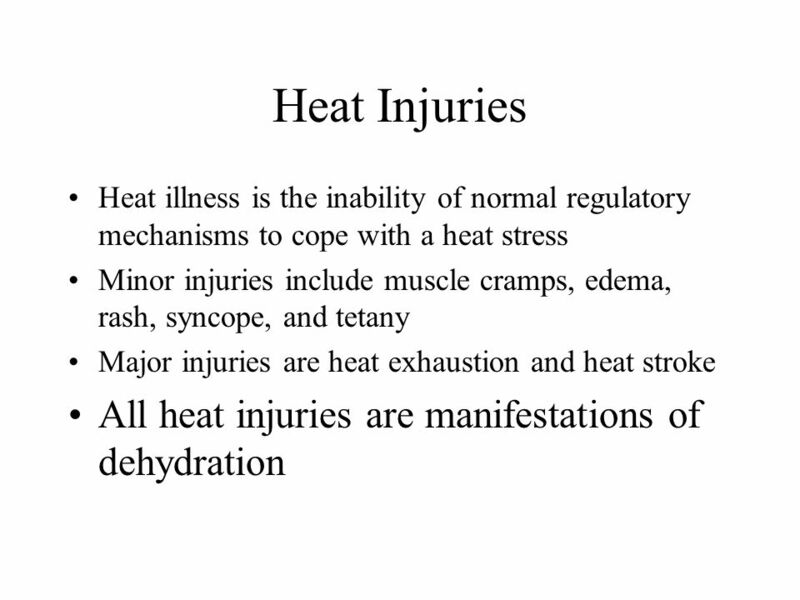 HEAT INJURIES. 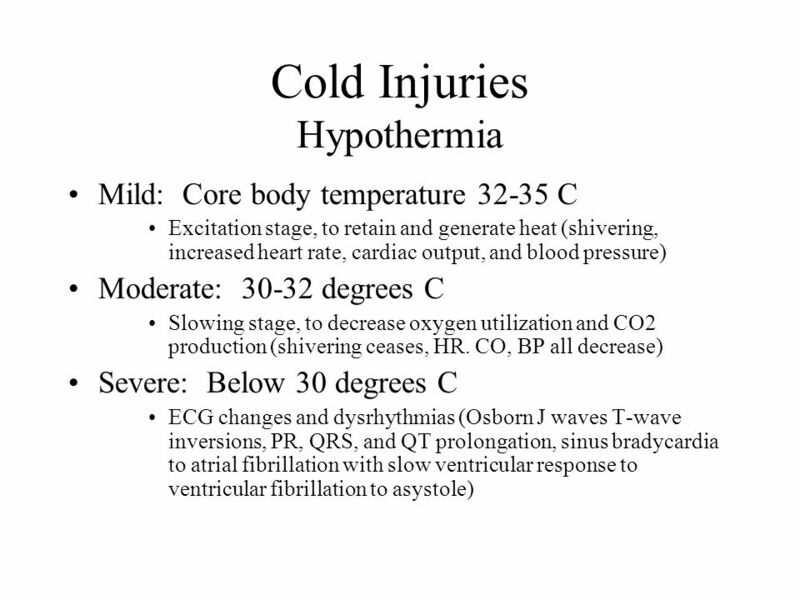 OBJECTIVES l Risk Factors l Types of Heat Injury *symptoms, cause and treatment l Pre-hospital care l Management. 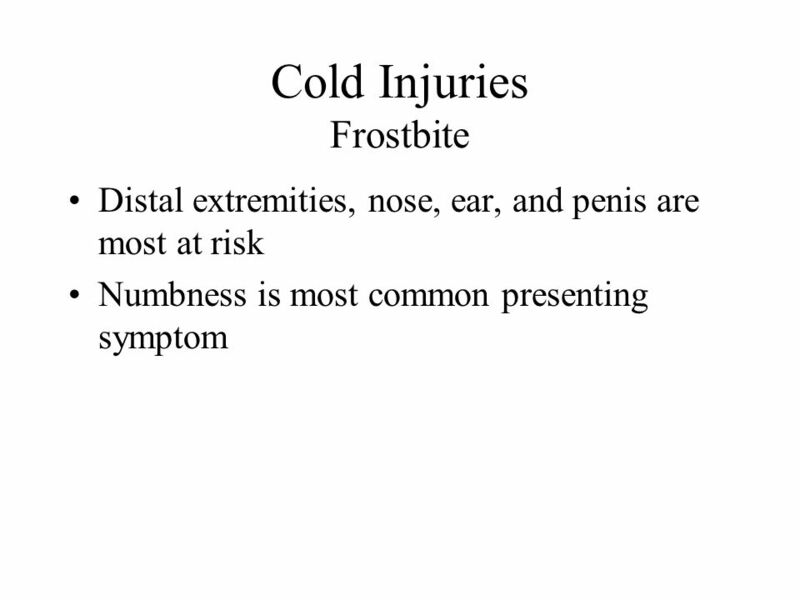 Recognizing Environmental Illness Sports Med 2. Clean Air Please AQI: Air Quality Index – an index for reporting daily air quality. – It tells you how.